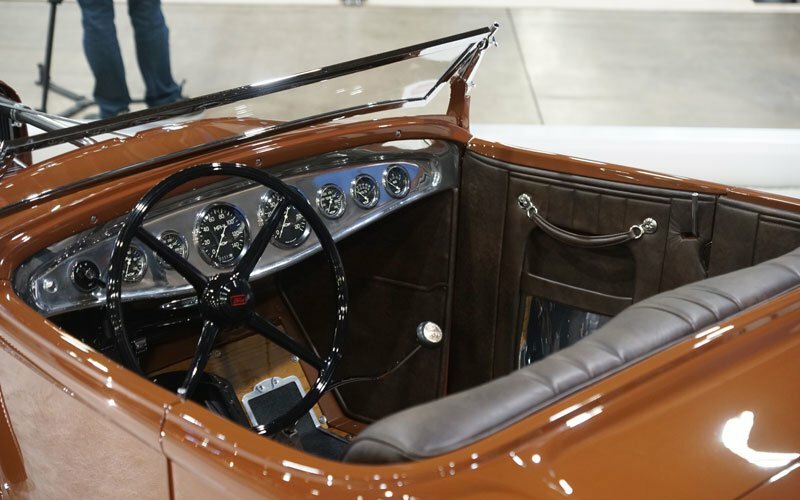 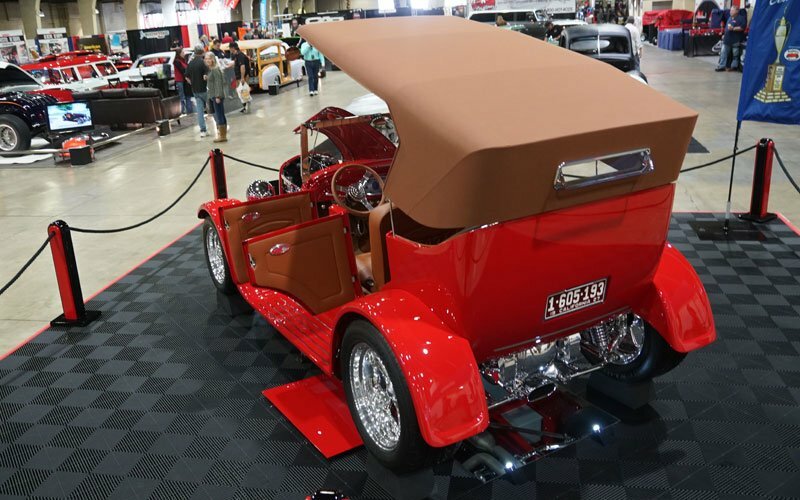 Famous car collector and racer George Poteet told us he had his 1936 Ford Roadster painted the color of chocolate milk. 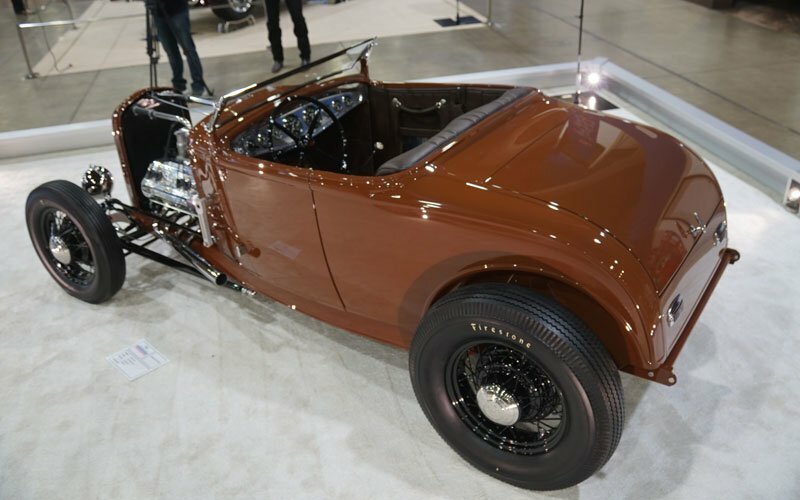 It is reminiscent of a time when you could buy a chocolate milk for 3 cents. 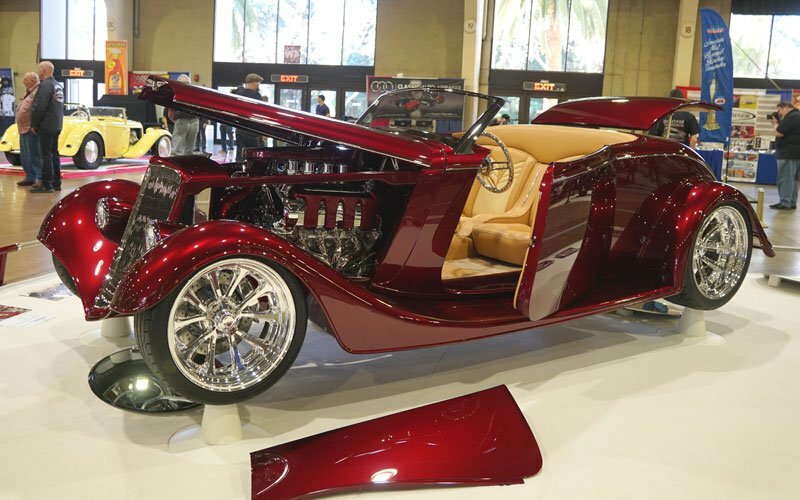 Thus he calls it the “Three Penny” roadster. 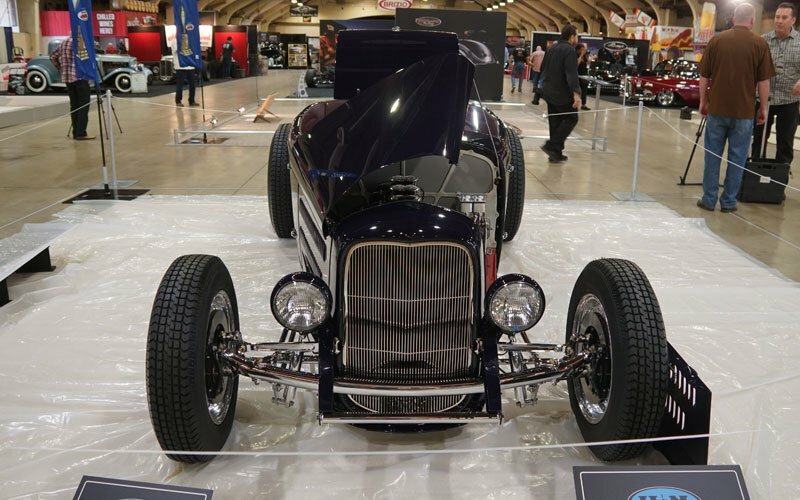 The Grand National Roadster Show is in its 70th year. 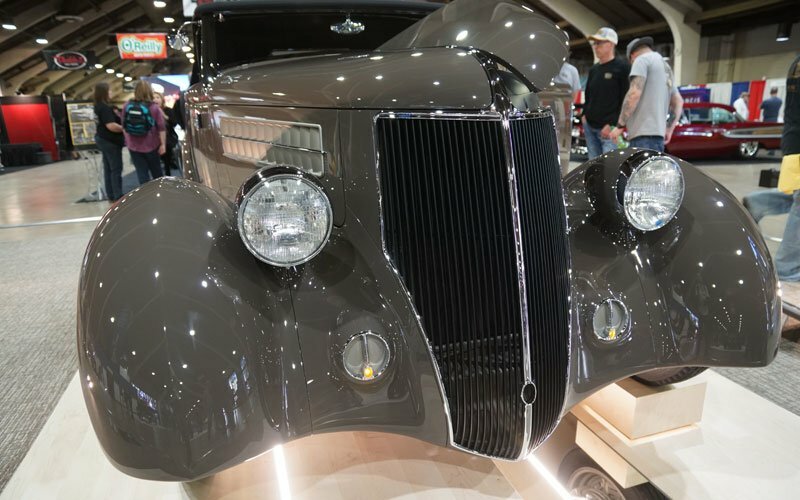 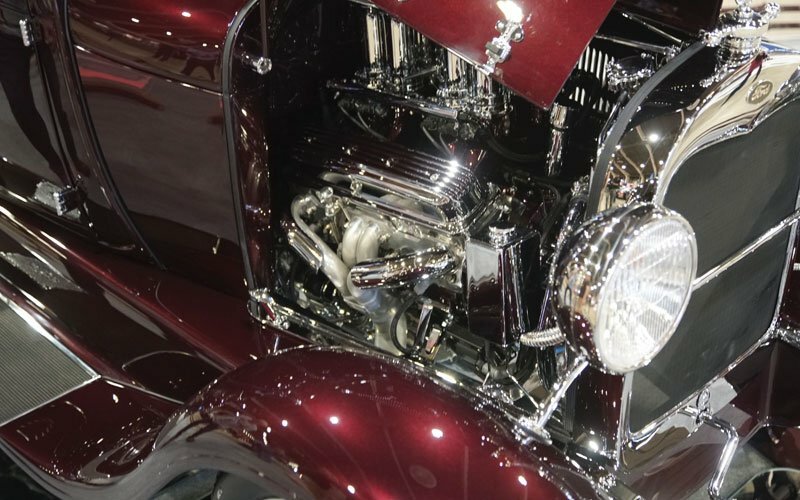 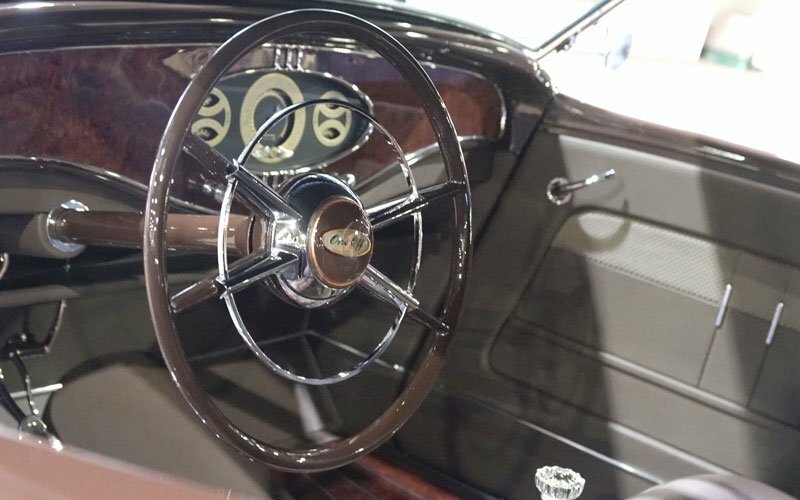 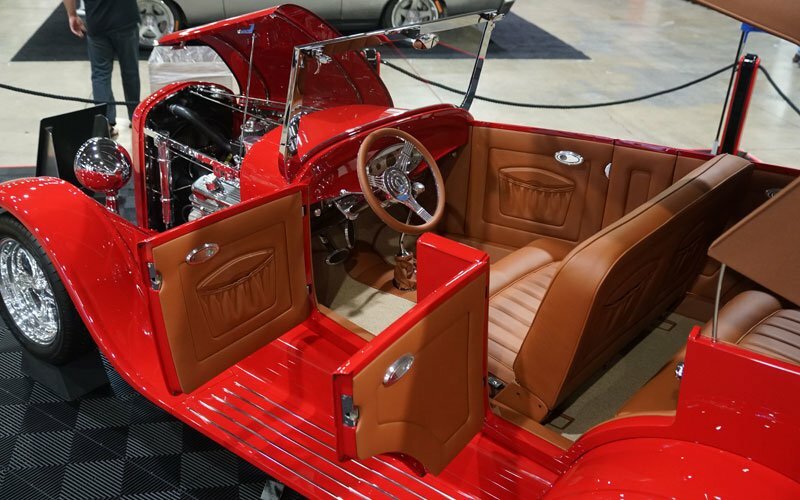 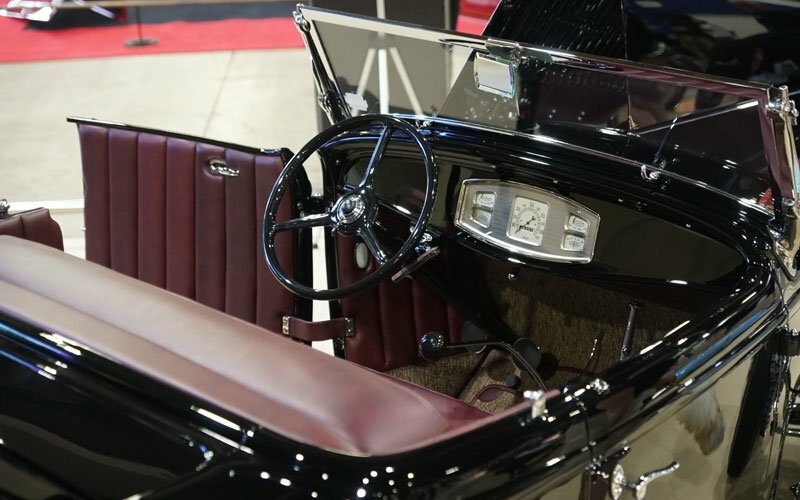 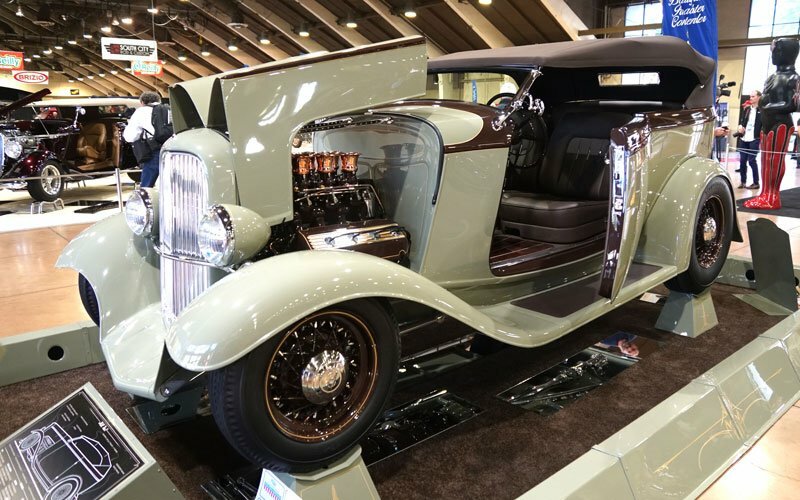 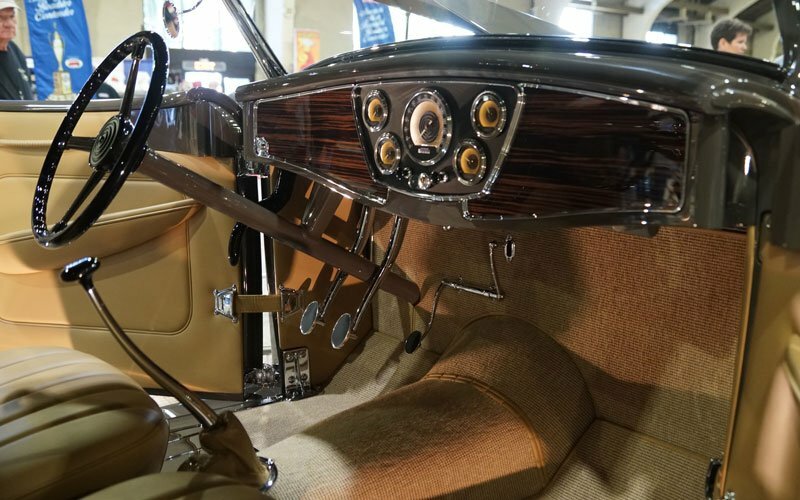 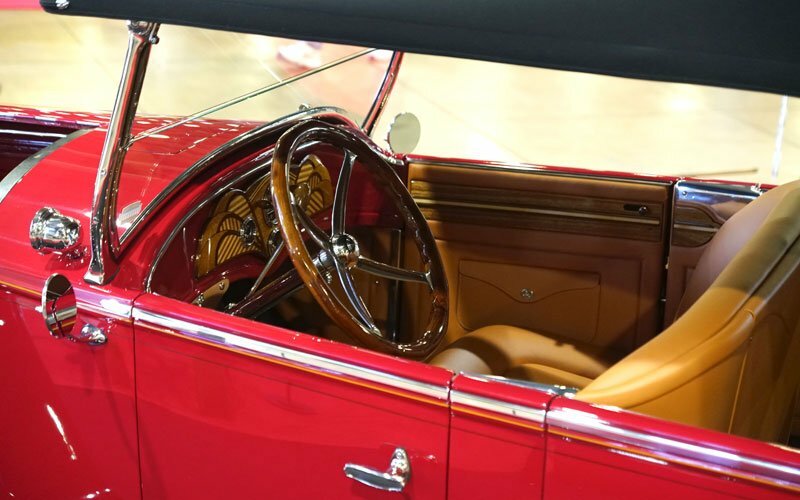 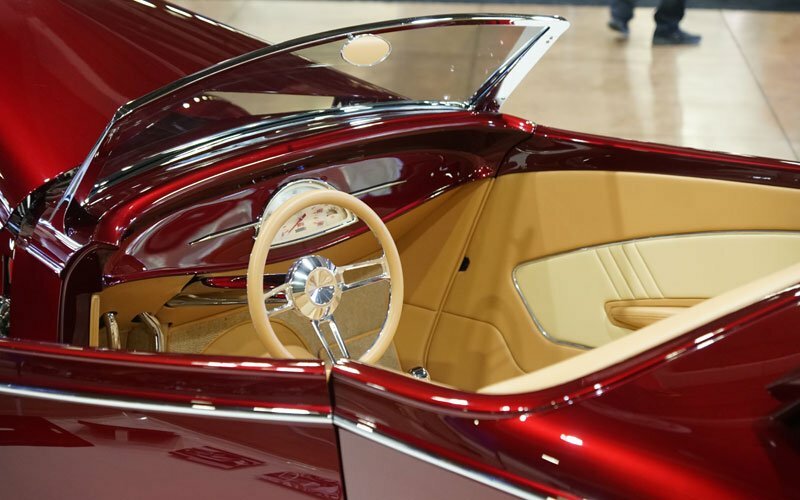 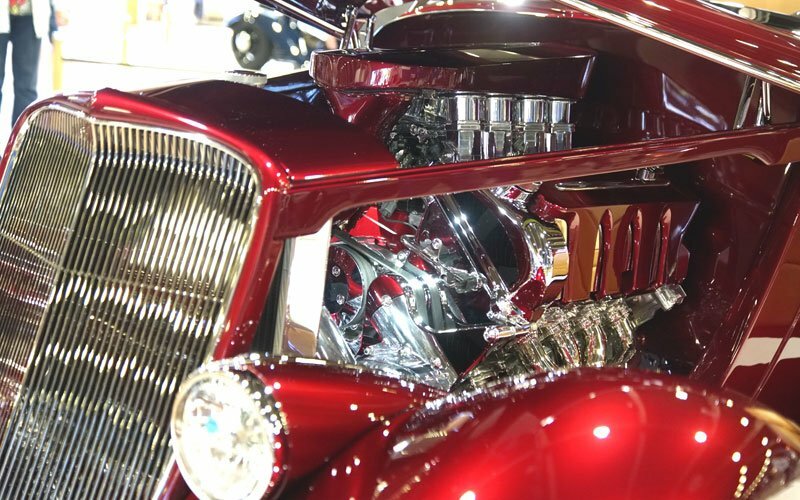 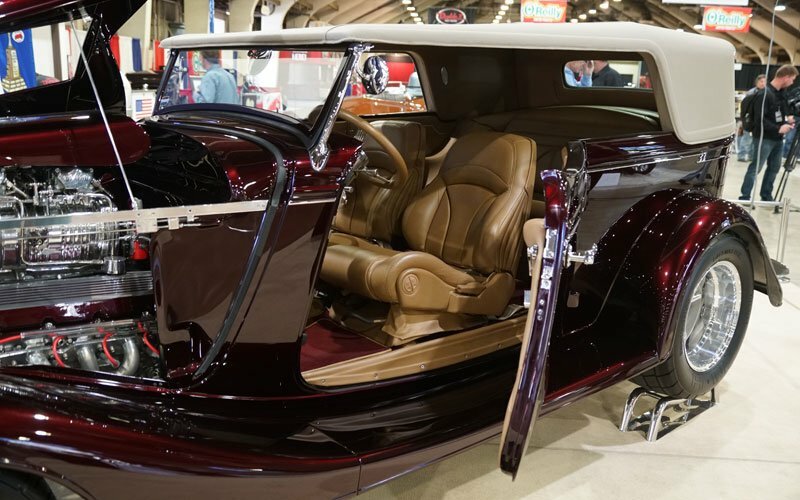 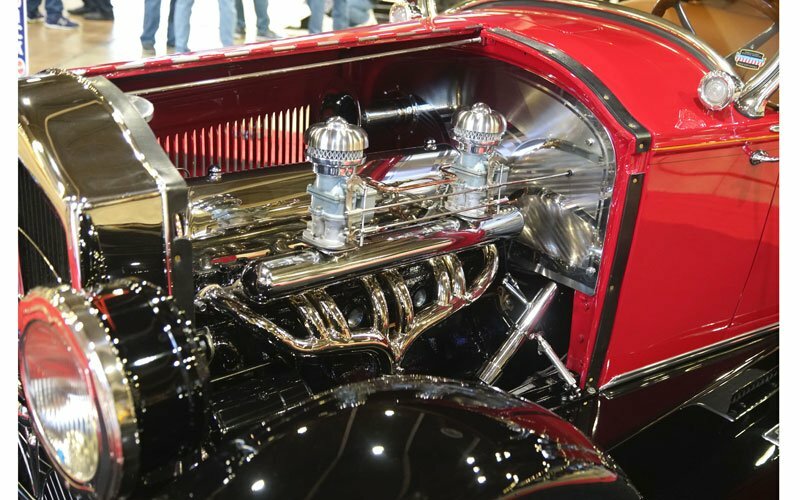 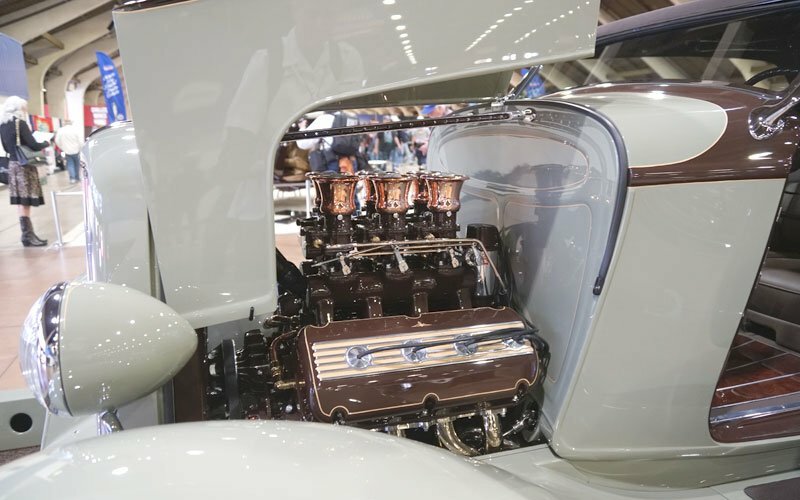 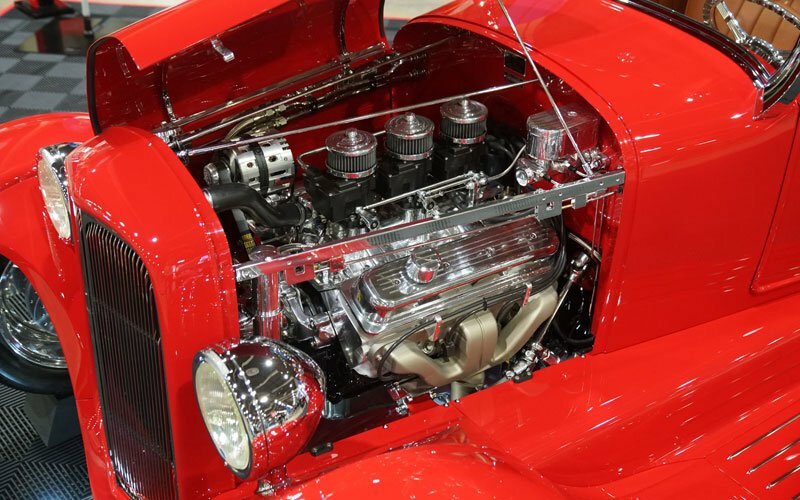 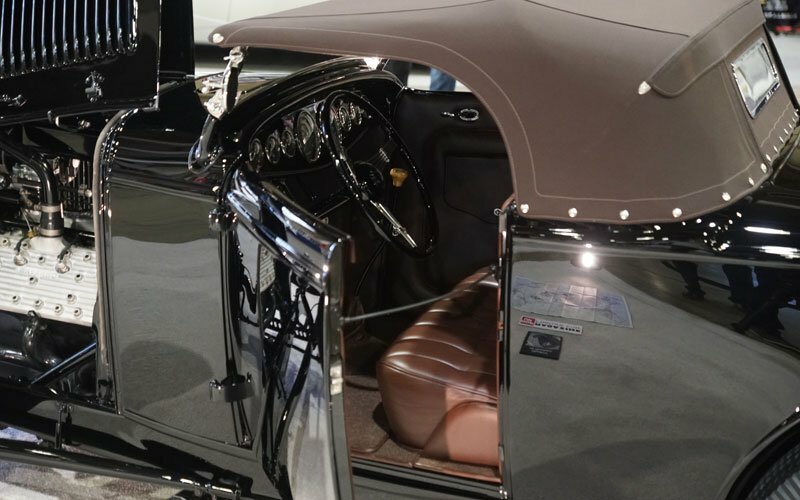 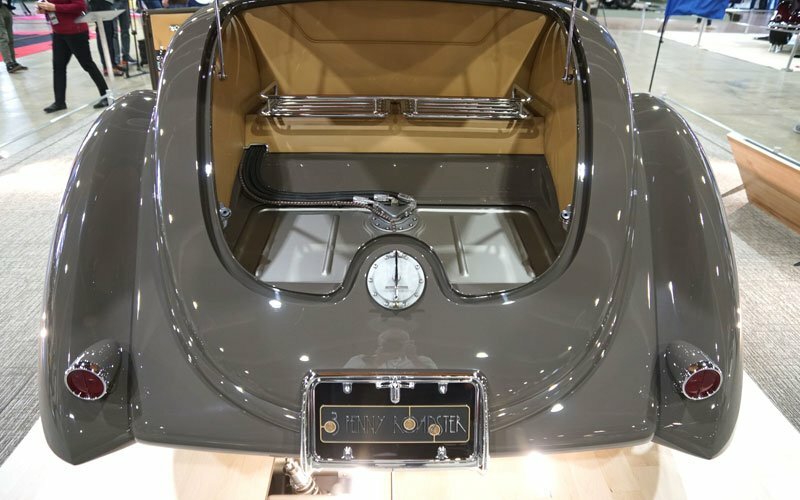 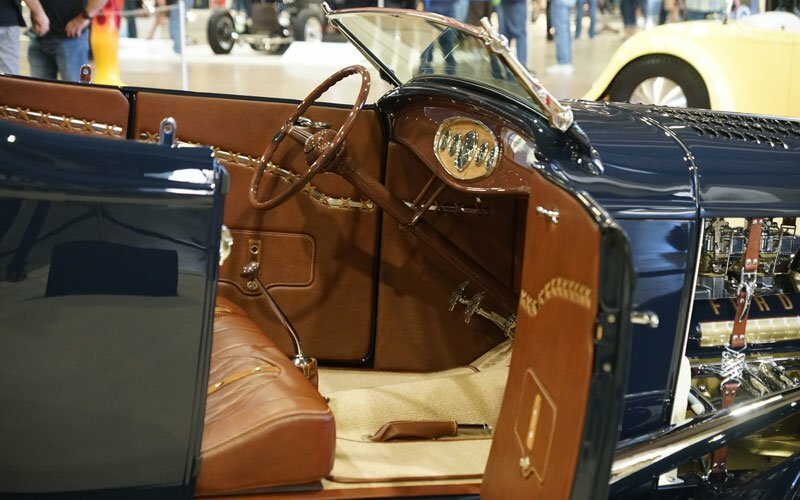 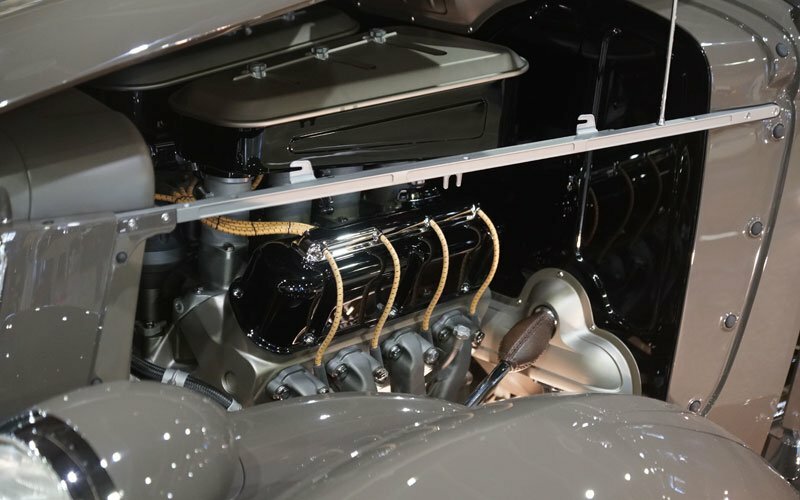 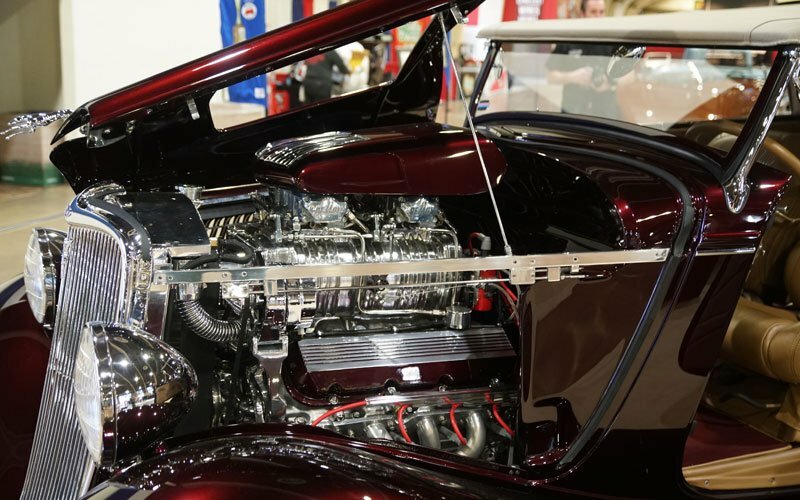 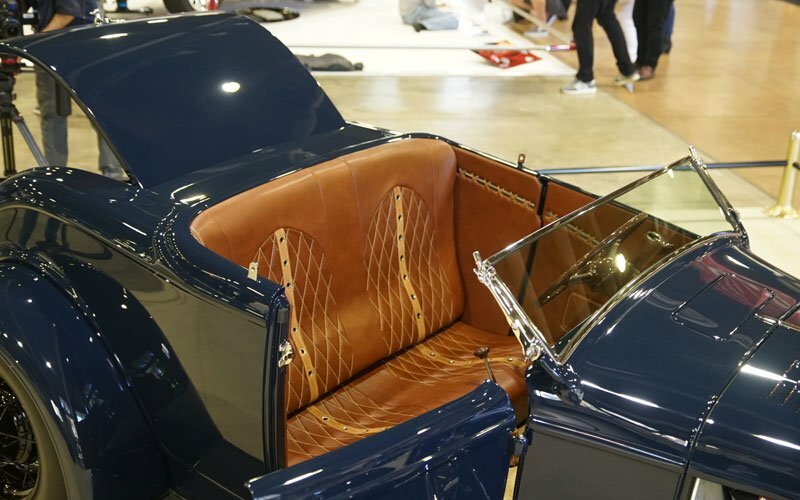 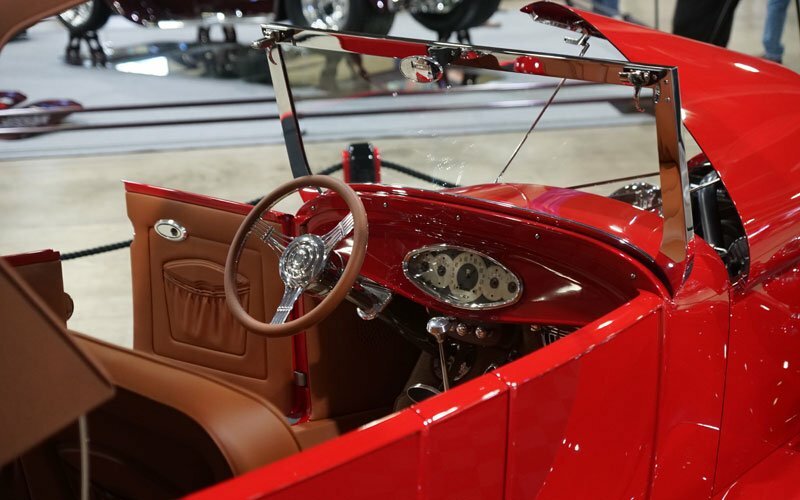 The annual custom car show is synonymous with its most coveted award, the America’s Most Beautiful Roadster Trophy, a monumental trophy on which some of the greatest custom car builders have their names engraved. 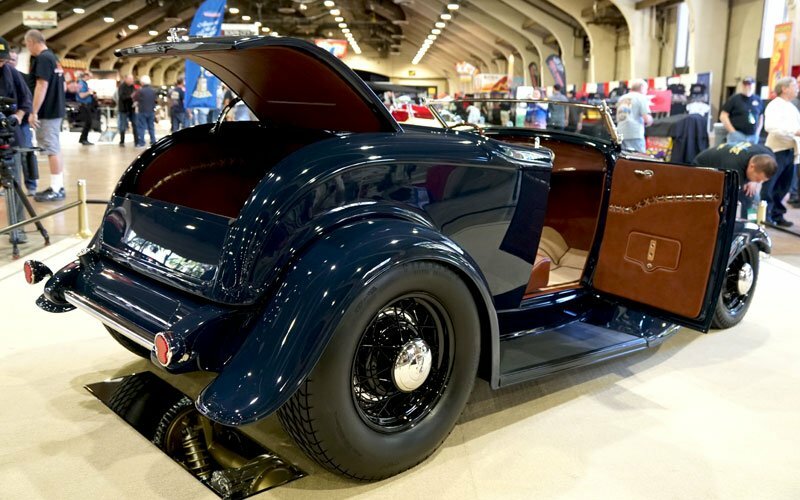 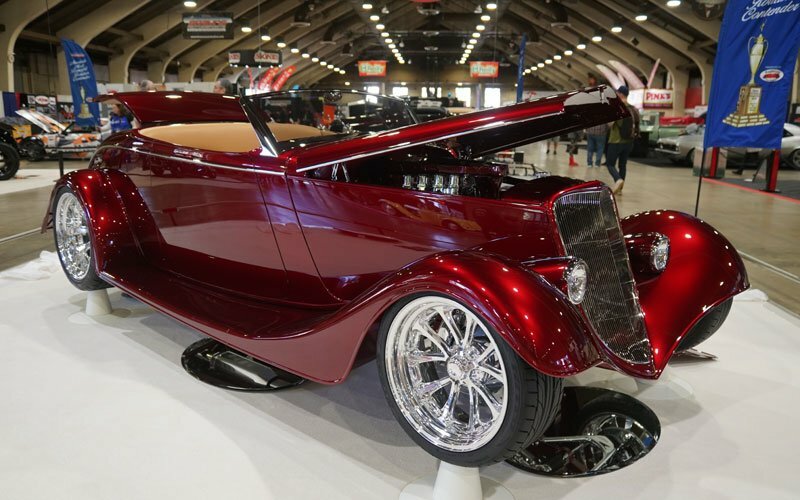 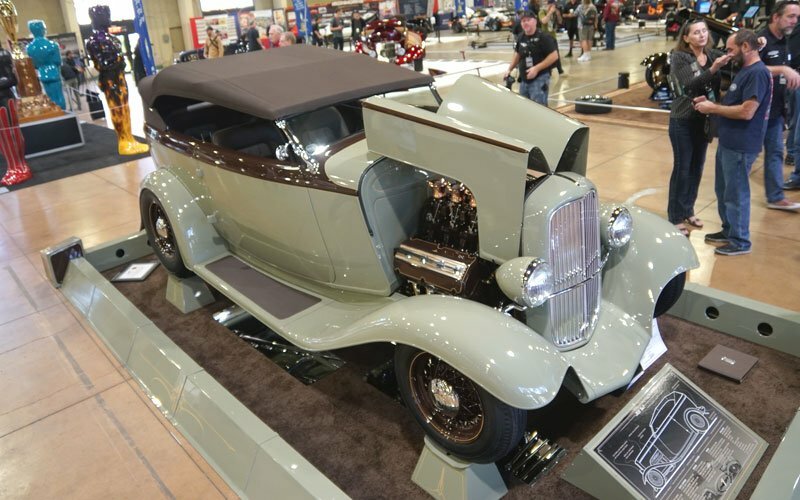 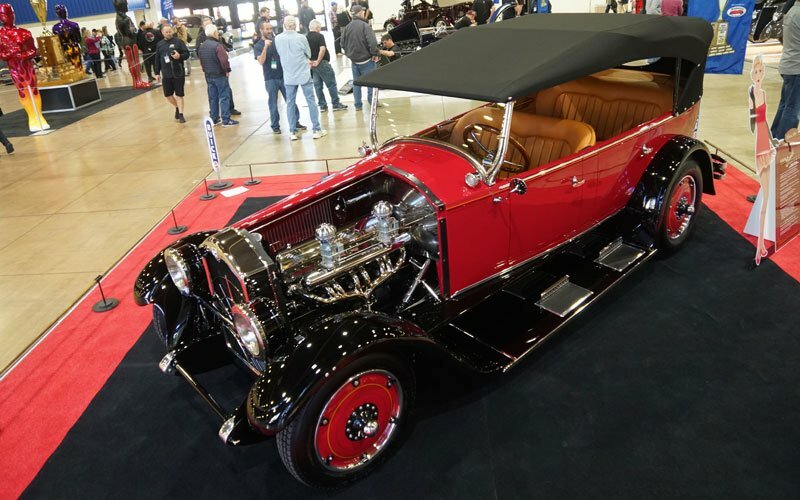 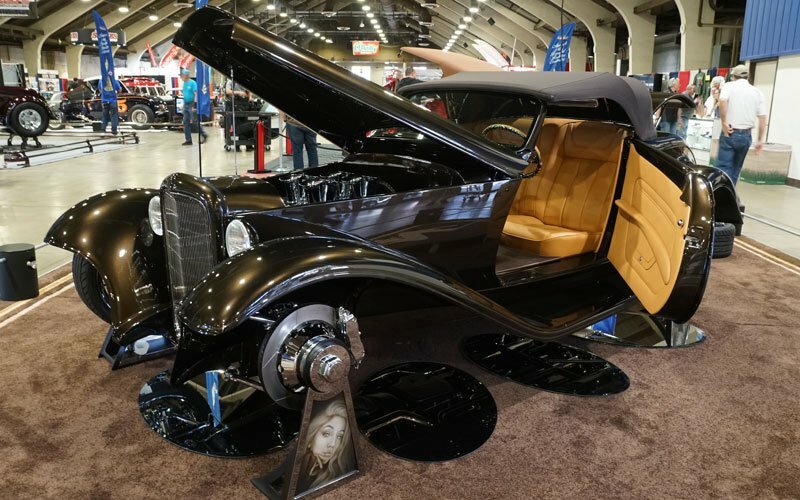 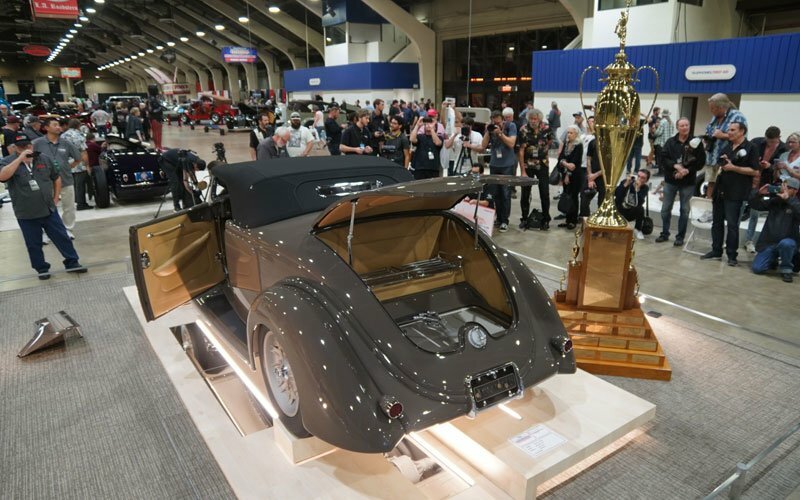 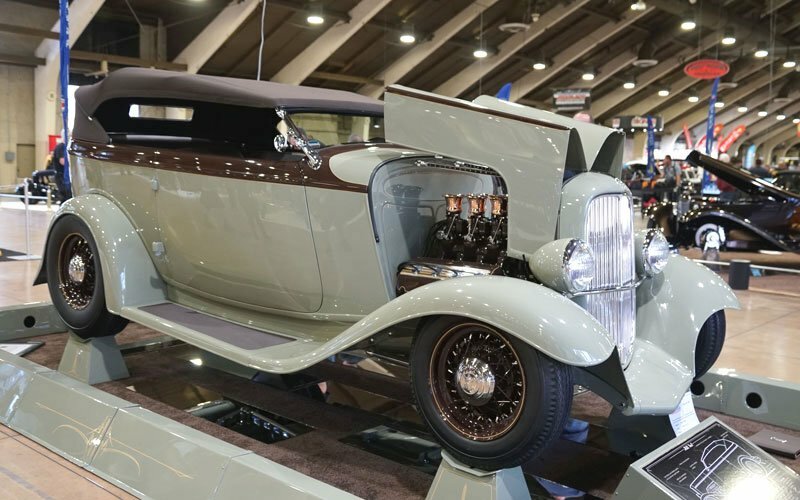 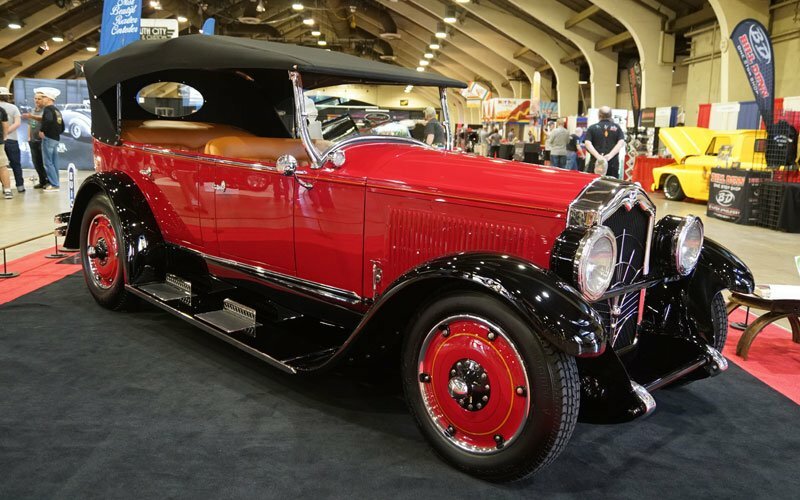 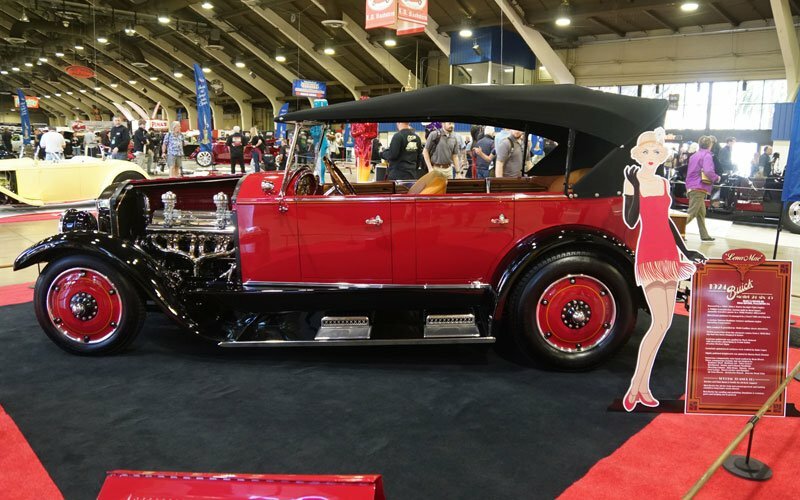 Each year a new name is added to the trophy when the Grand National Roadster Show convenes at the Fairplex in Pomona, California. 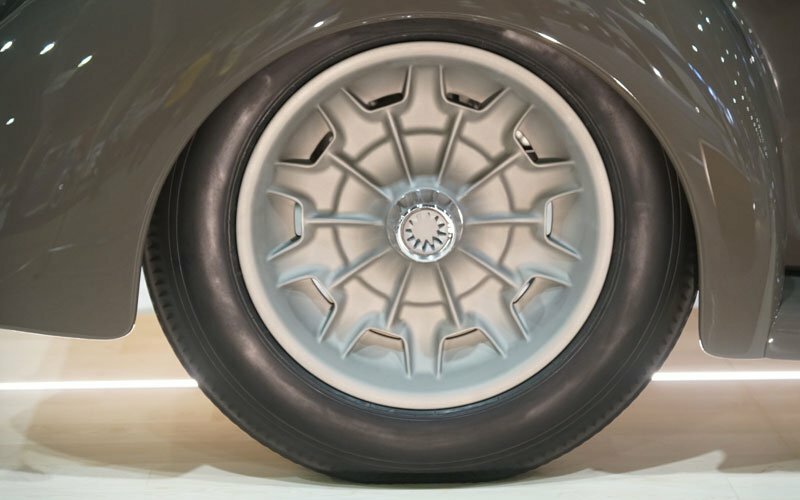 This year there were fourteen contenders for the award. 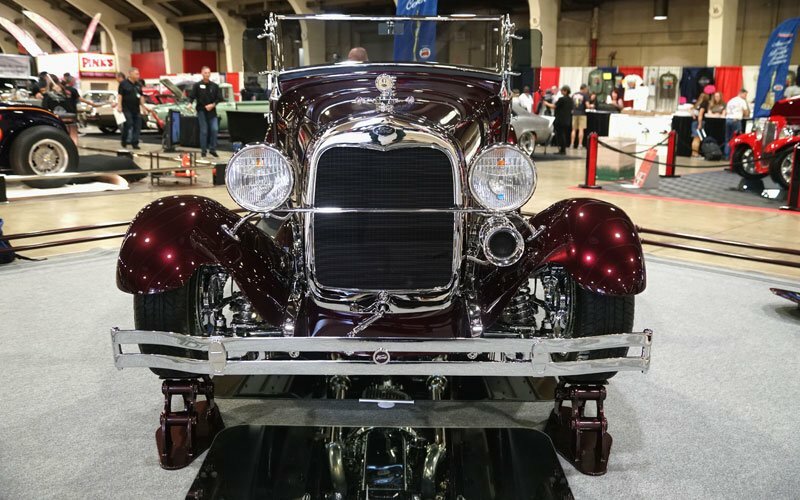 Cars-On-Line.com is at the GNRS this weekend to bring our readers up close and personal with all the action. 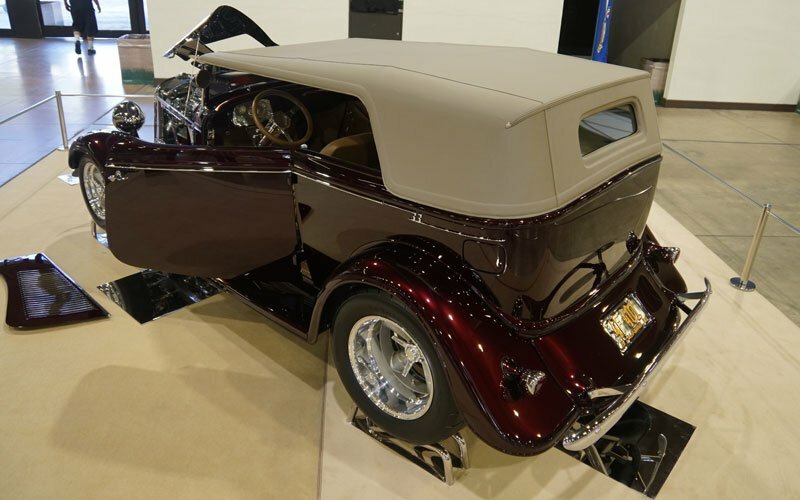 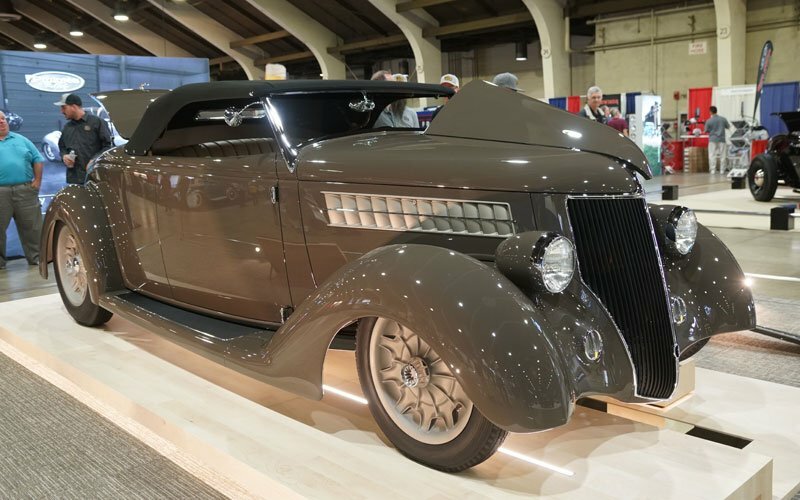 Chip Foose designed the 1932 Ford Phanton Roadster owned by Gary Corkell. 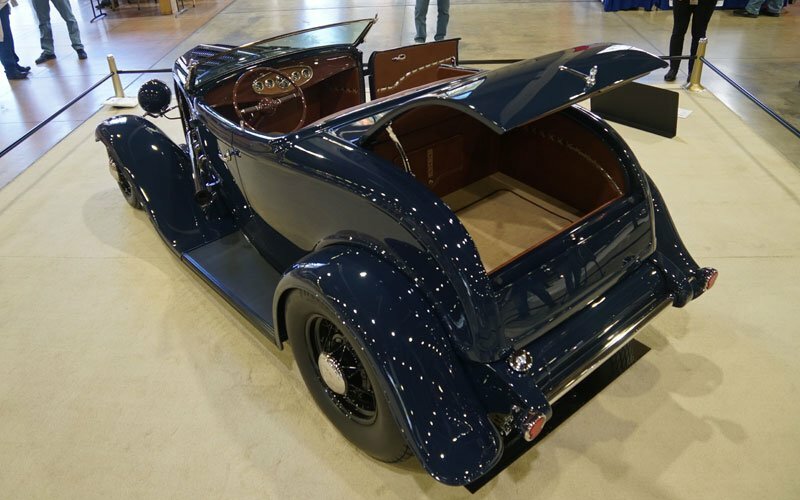 The Brookville body was built by One-Off Custom. 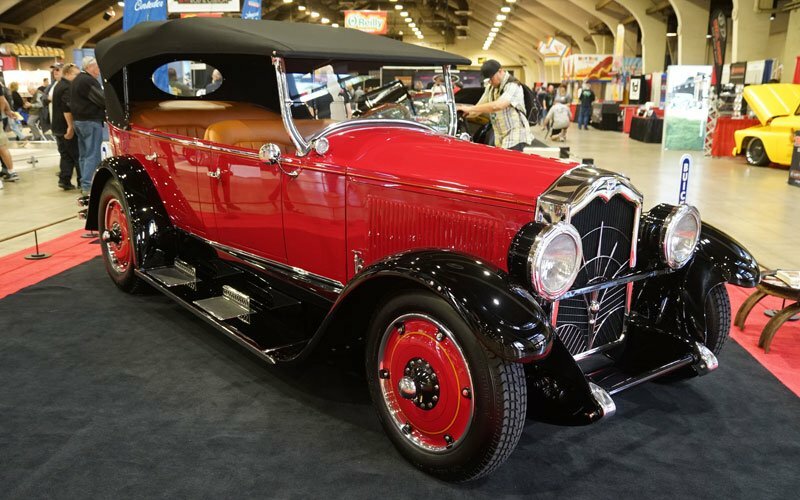 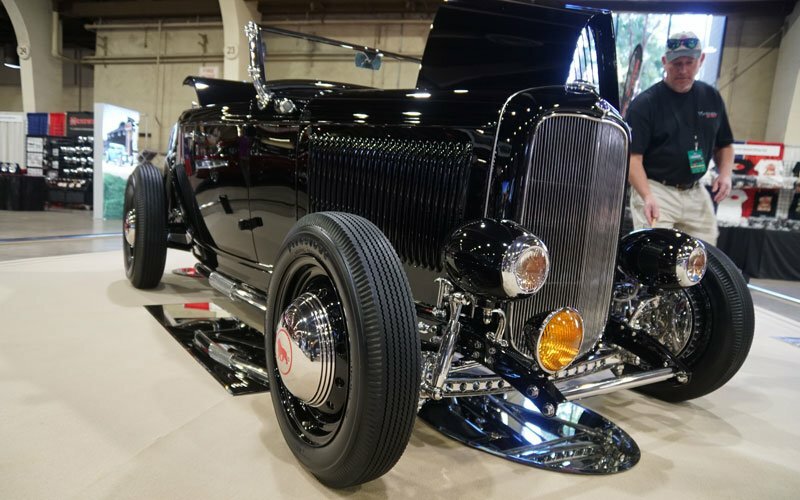 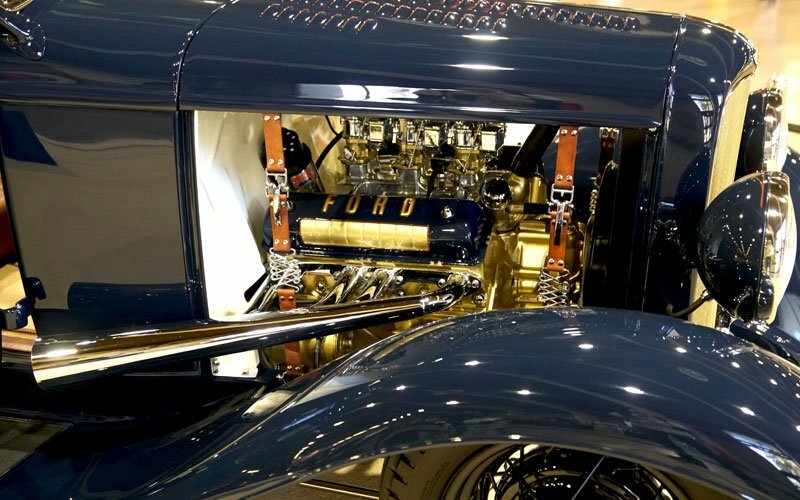 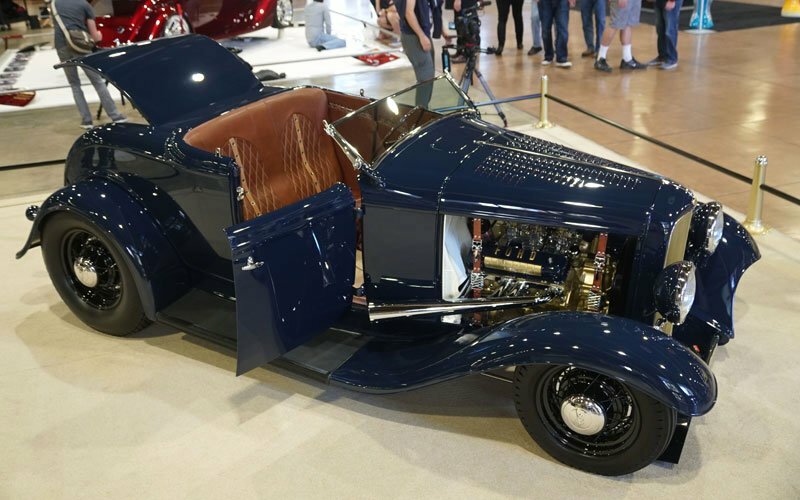 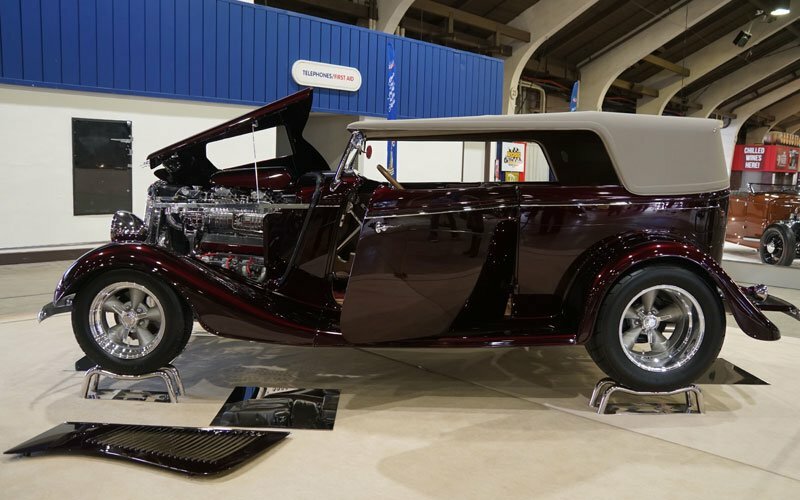 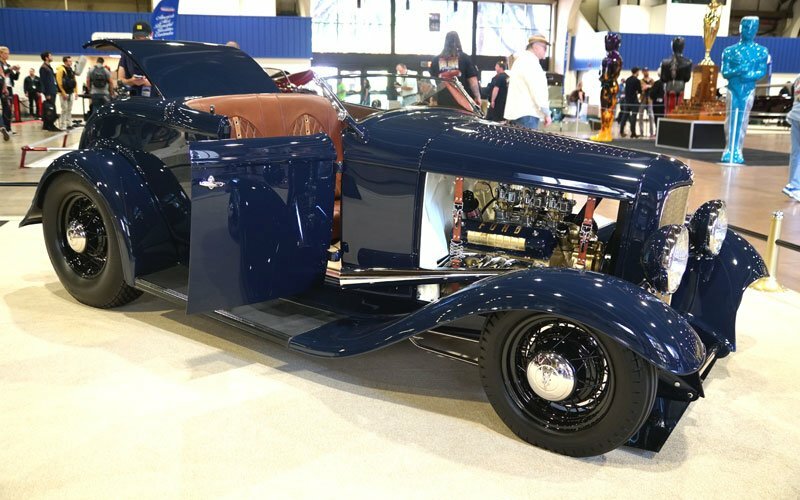 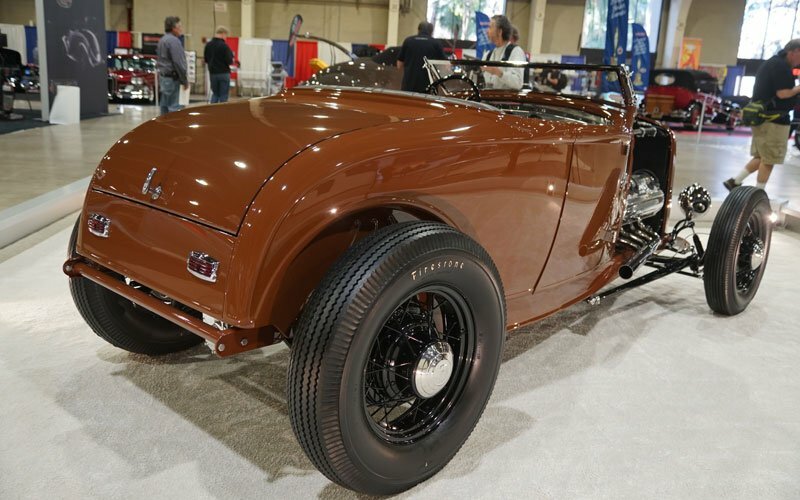 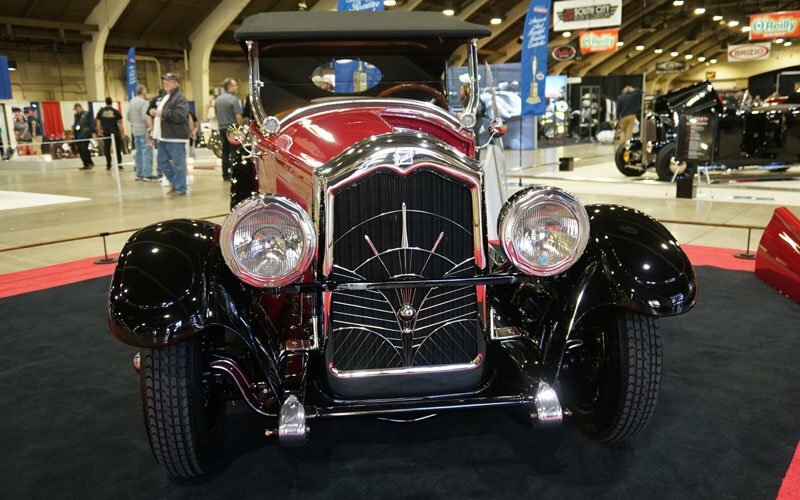 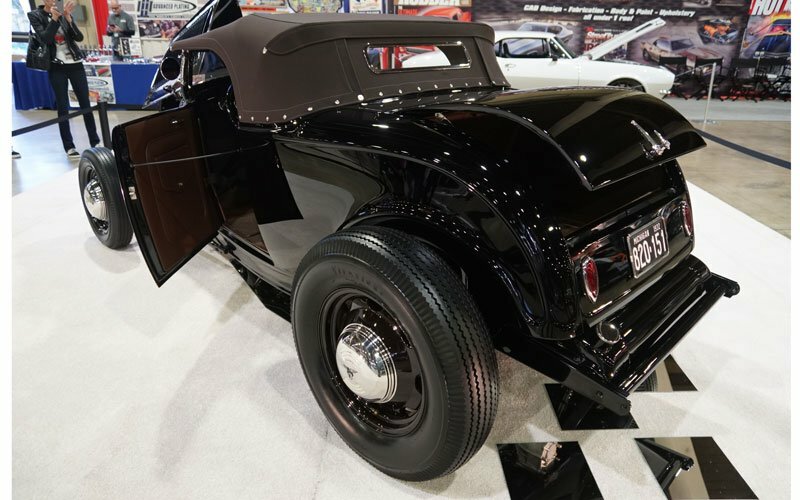 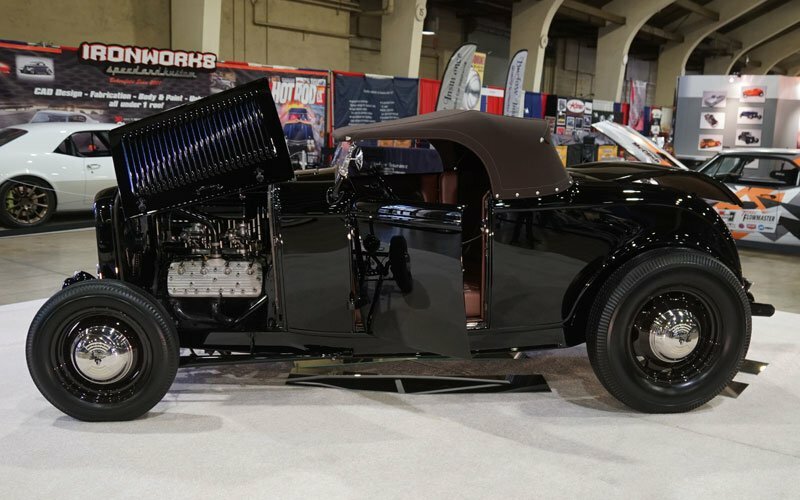 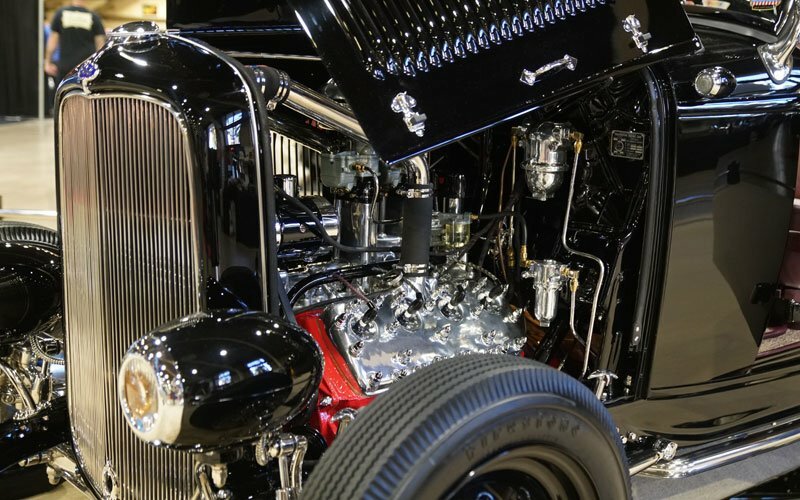 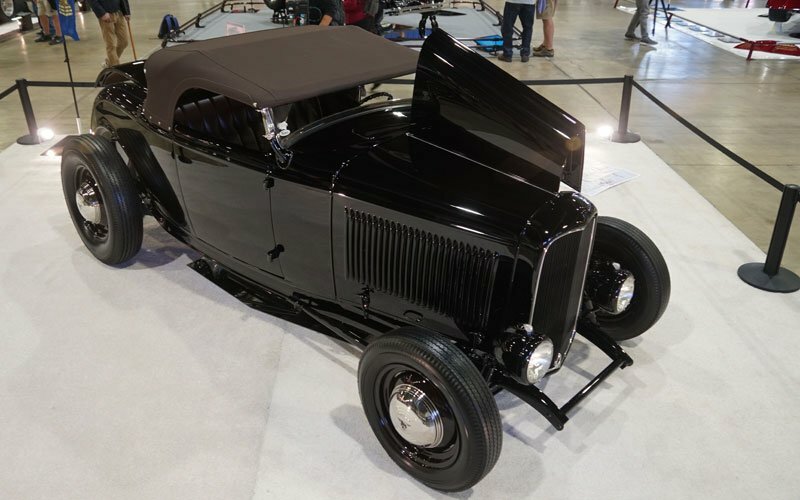 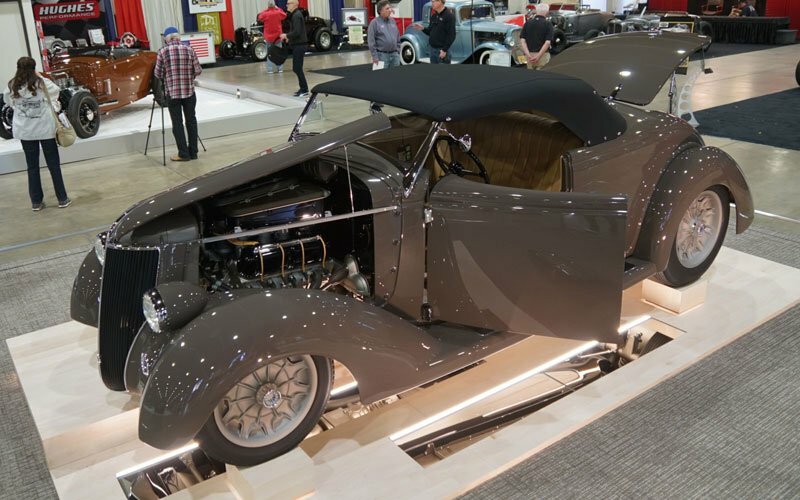 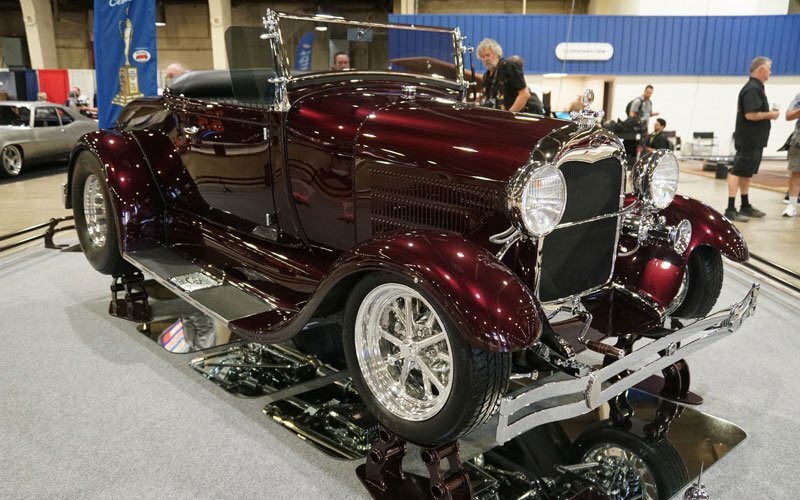 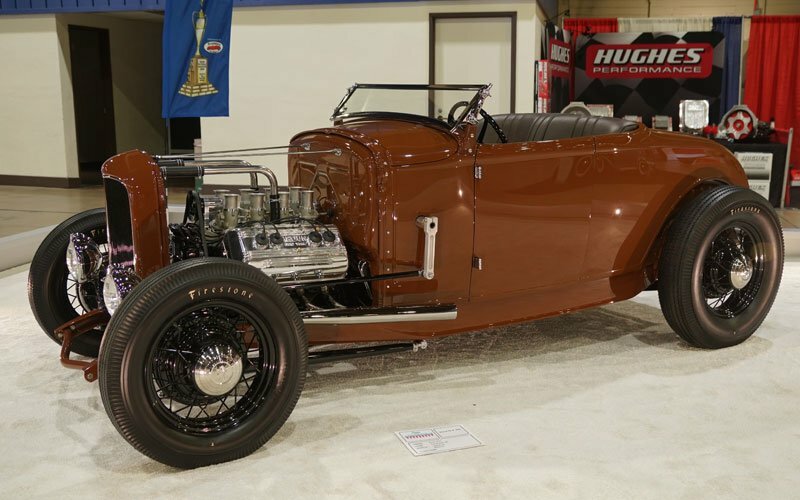 Built by Jim Grant and his friends from the Boise, Idaho area, this is an all-Henry’s-steel 1929 Ford Roadster. 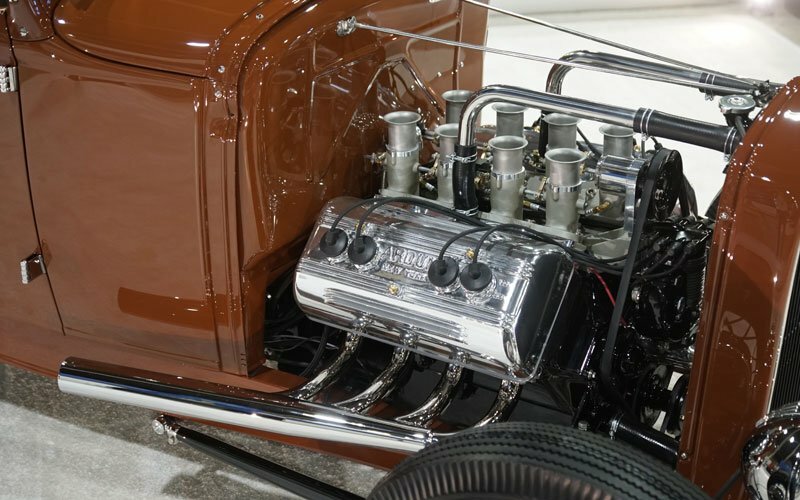 The engine is a Chevy LT1 built by Valley Crankshaft dyno’d at 450 horsepower. 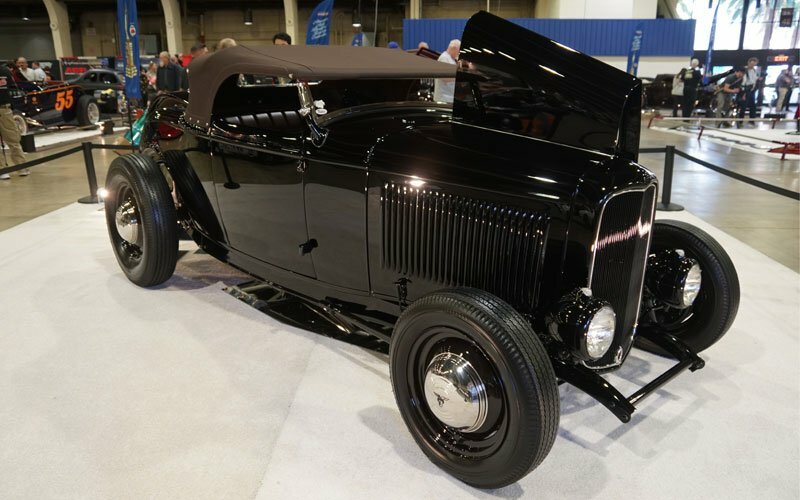 All Fords here except this 1924 Buick Touring Resto Rod brought by owner and builder Ryan Rivers of Fullerton, California. 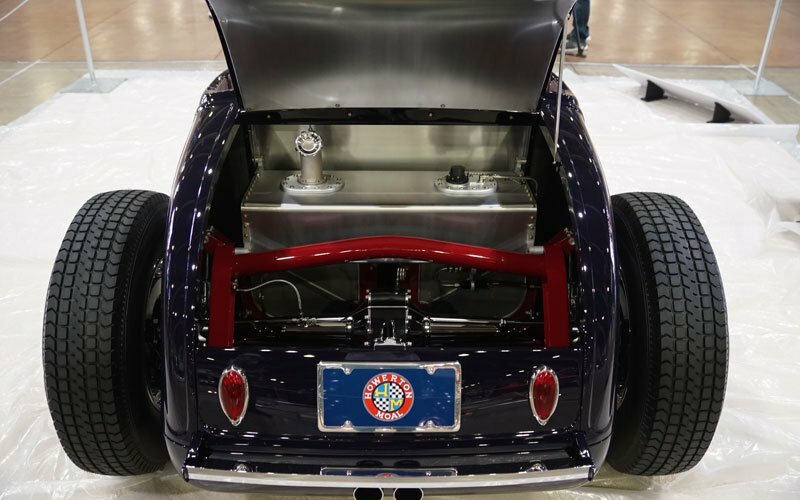 This is a very special build. 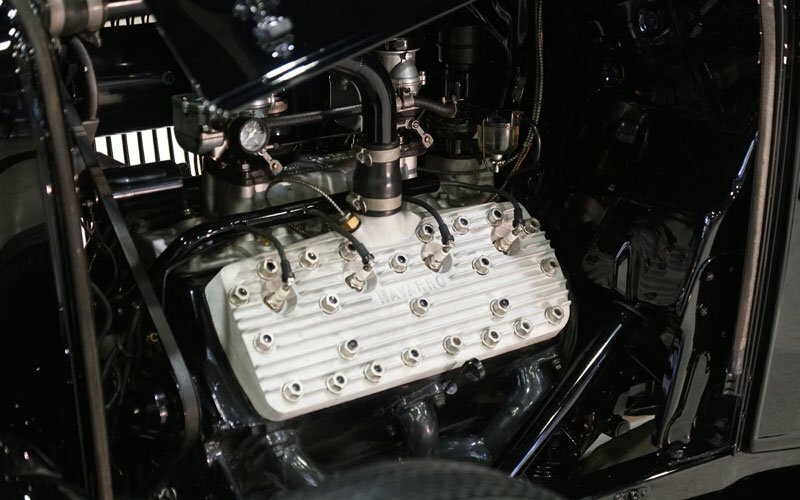 The 263 ci Buick Straight 8 engine transfers power to a 700R4 transmission custom built by Brad Smart. 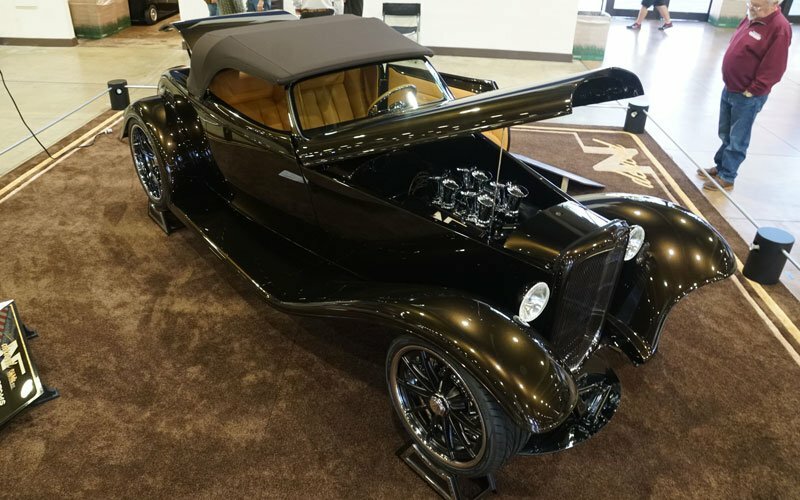 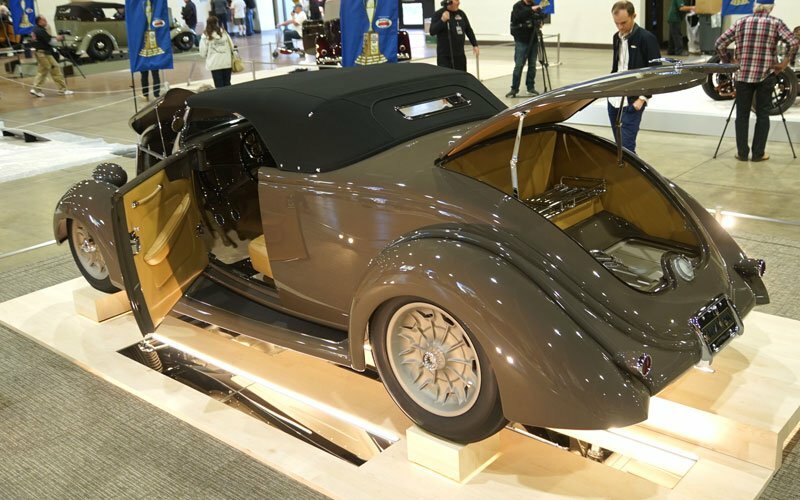 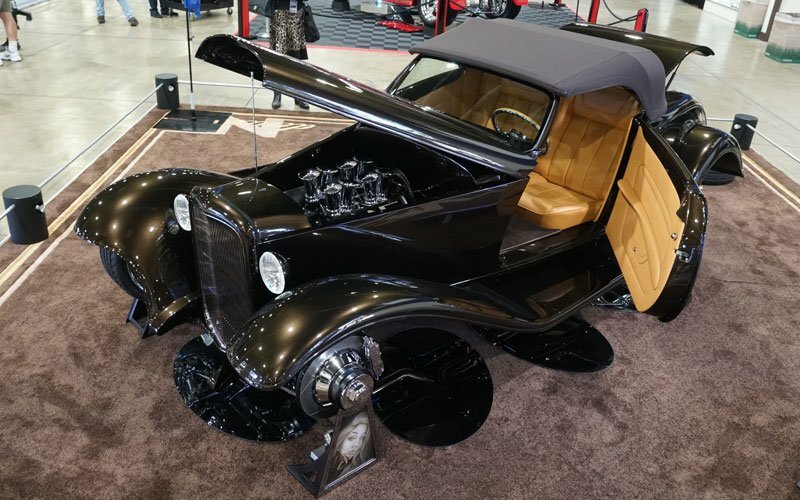 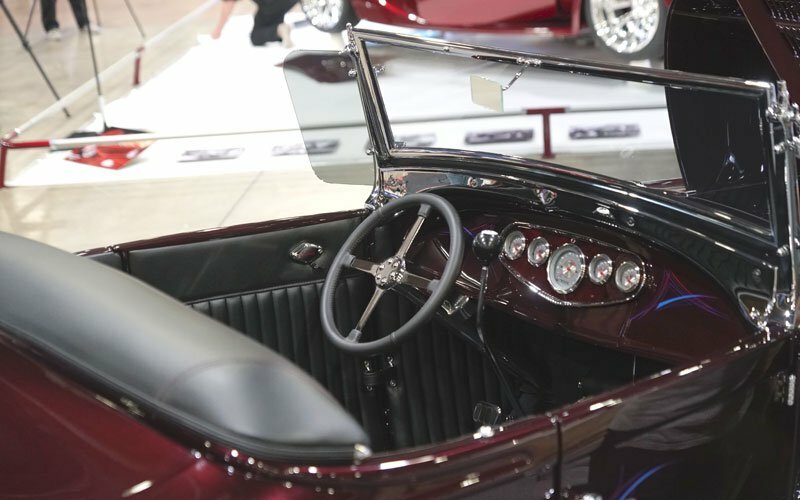 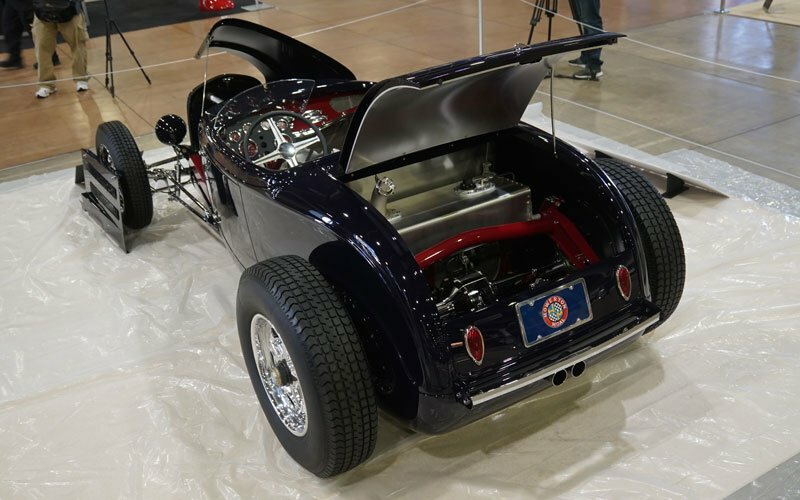 Cory Taulbert from Clarkston, Michigan built his 1932 Ford Roadster, and now his custom dream car is in contention for the America’s Most Beautiful Roadster trophy. 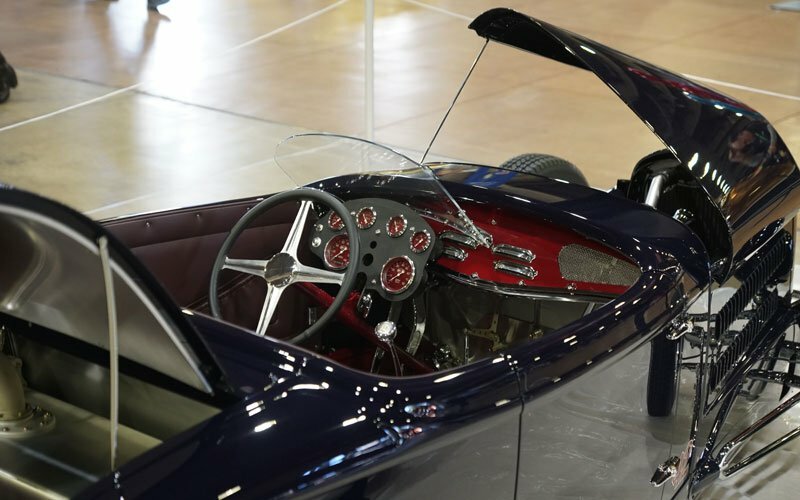 What a journey its been. 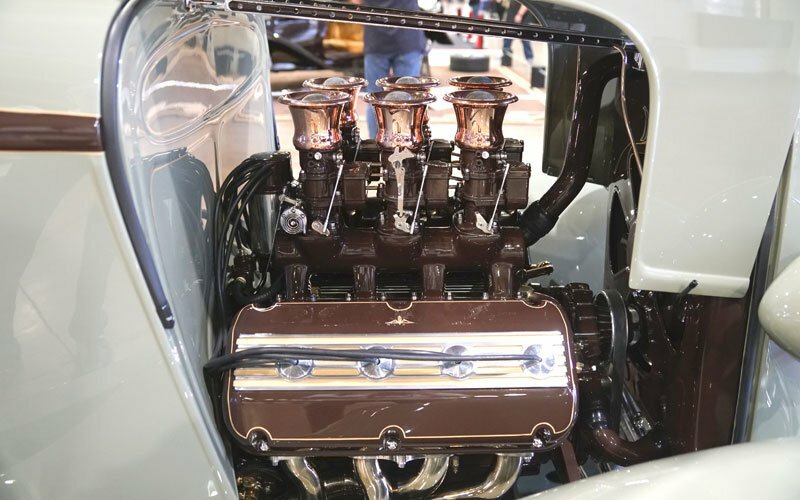 Paint by Vintage Color Studio, interior by Sid Chavers, engine by H&H Flatheads. 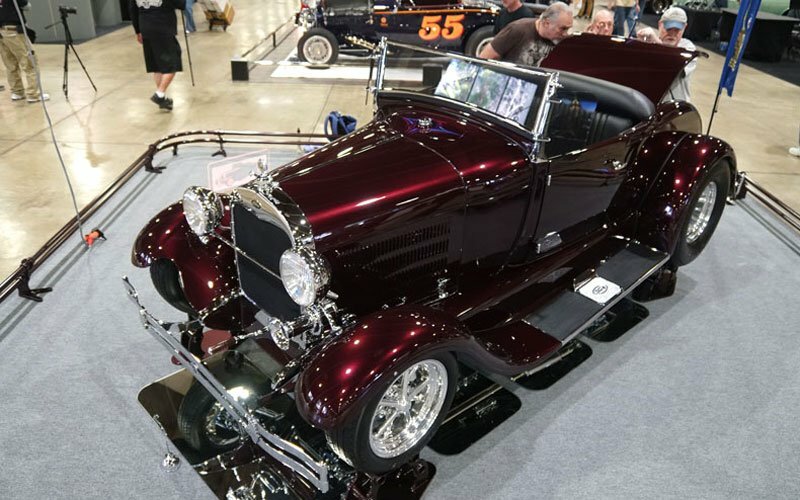 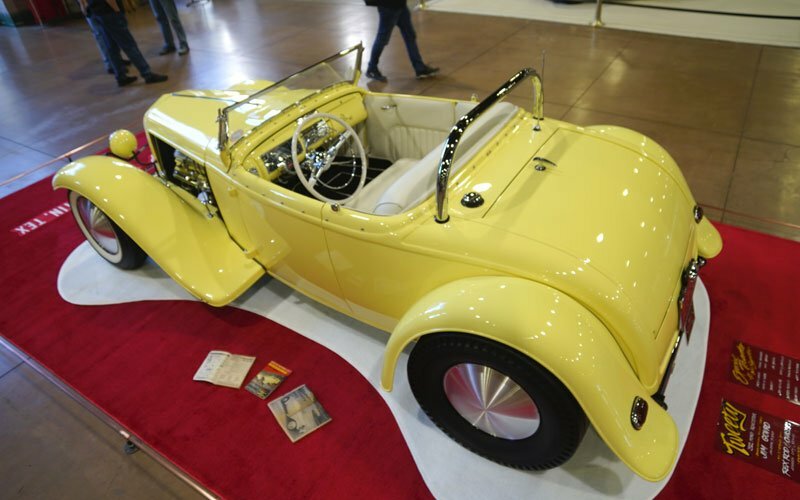 Owners Dawn and Tim Kerrigan of Sonoma, California will compete for the America’s Most Beautiful Roadster Trophy with their 1933 “Timeless” Ford Roadster. 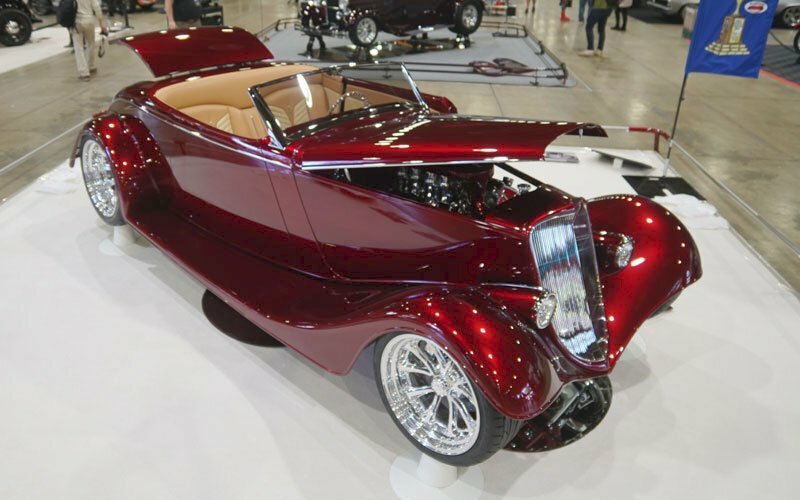 It was designed by Eric Brockmeyer and built by Dominator Street Rods. 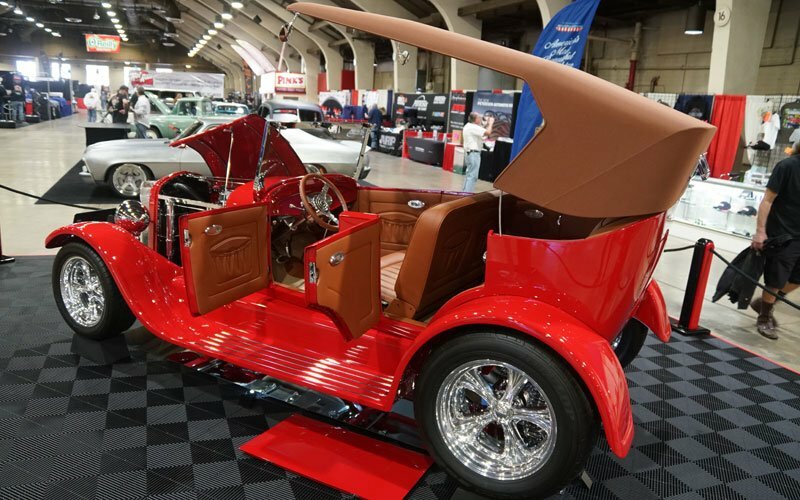 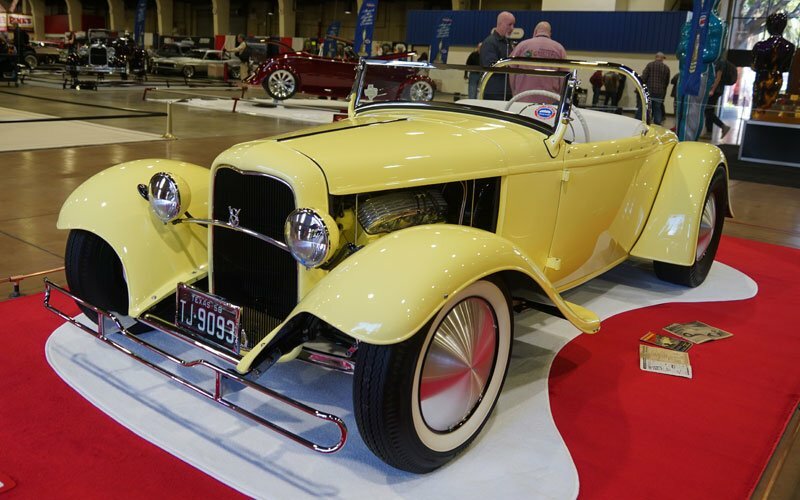 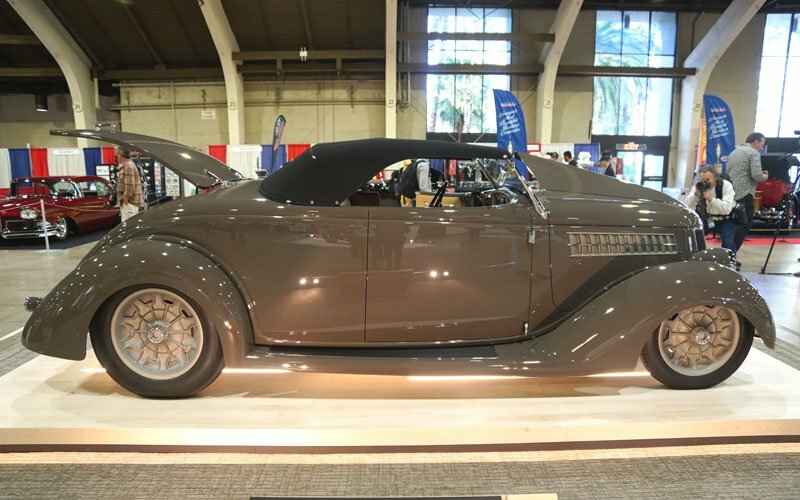 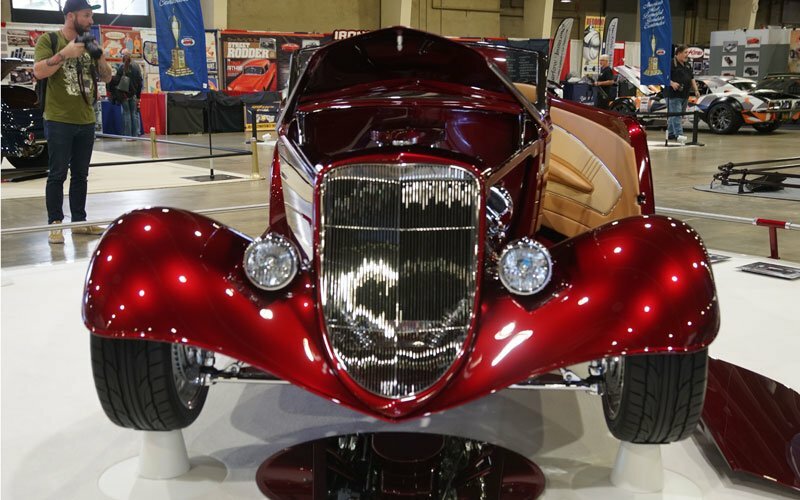 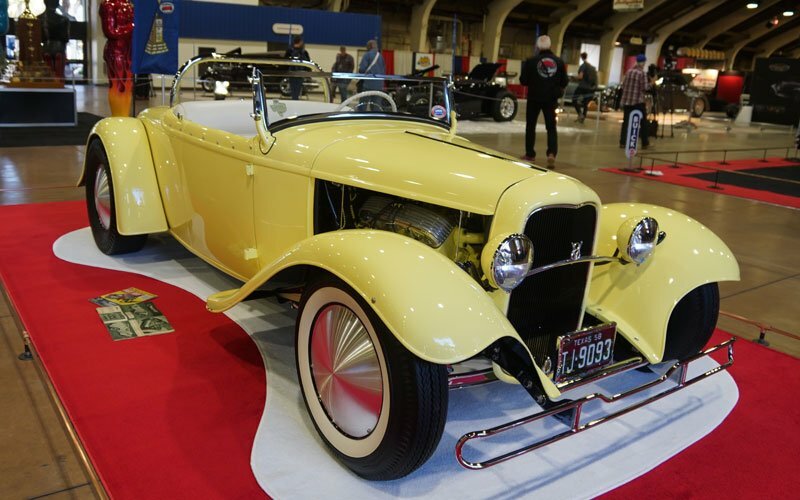 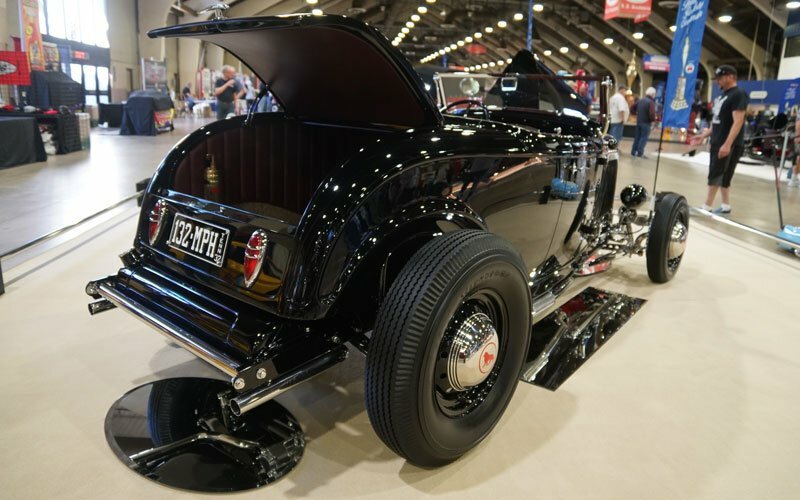 When Jim Govro from Austin, Texas built his 1932 Ford Roadster he calls “Tweety” he did not know he would one day be entering it in the competition to win the America’s Most Beautiful Roadster Trophy at the Grand National Roadster Show. 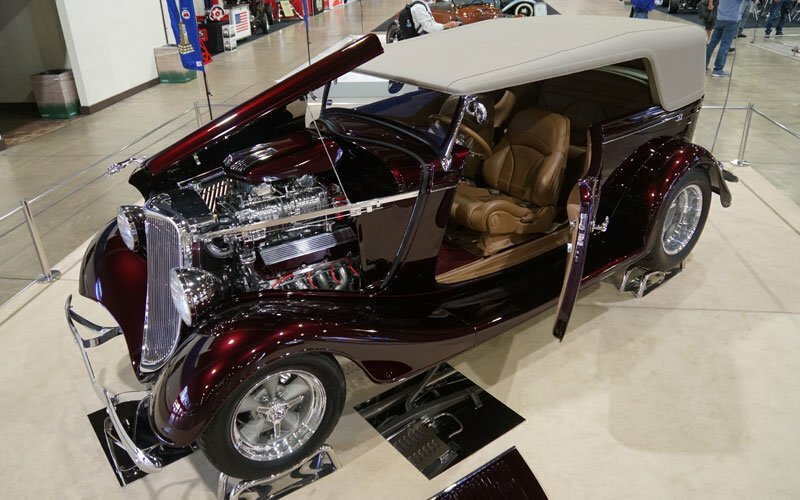 But recently he had Rex Rod & Chassis in Johnson City do a complete restoration. 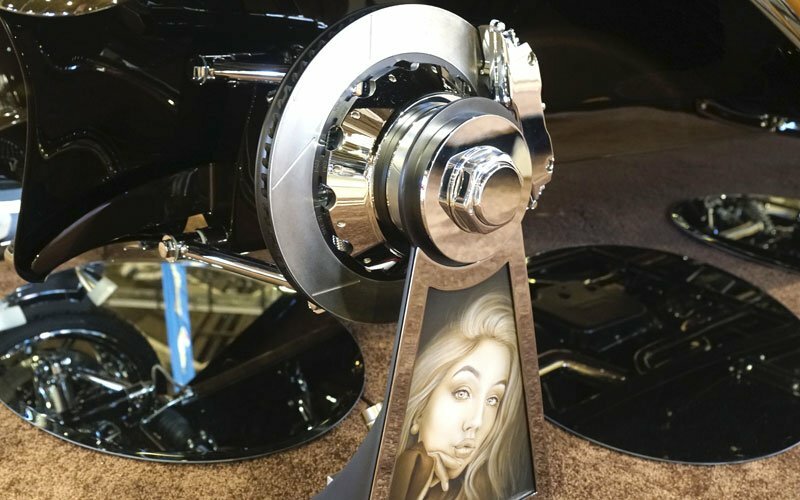 Custom paint by Shorty, Carlos Castenada interior. 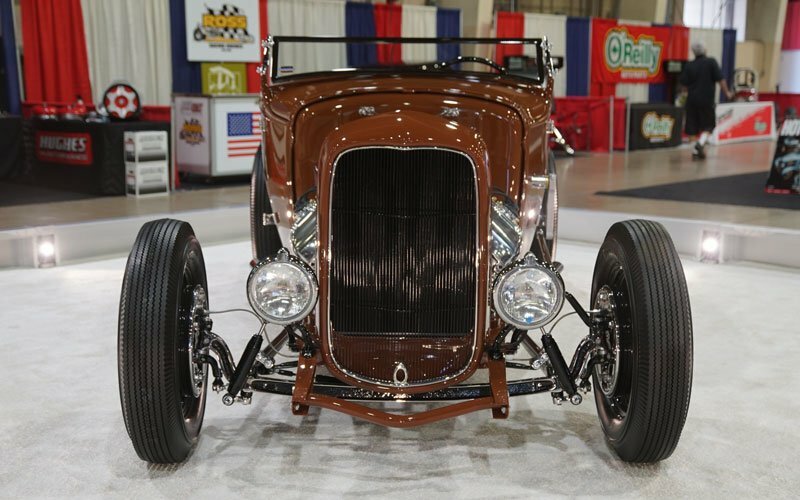 Jim Govro's 1932 Ford Roadster called Tweety. 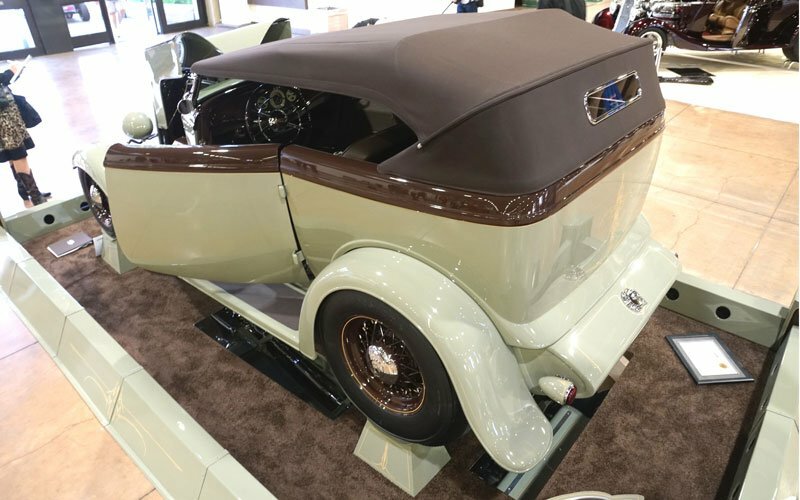 Ann and Andrew Bowen of Corryton, Tennessee have entered their 1932 “Vintage Spirit” Ford Roadster in the America’s Most Beautiful Roadster competition. 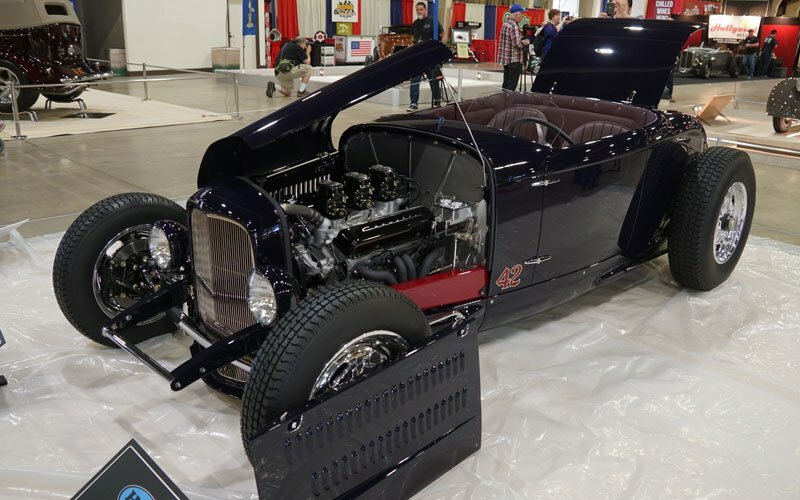 The builder was Dan Kerbo at Kerbo’s Kustom Klassics using a Brookville Roadster body. 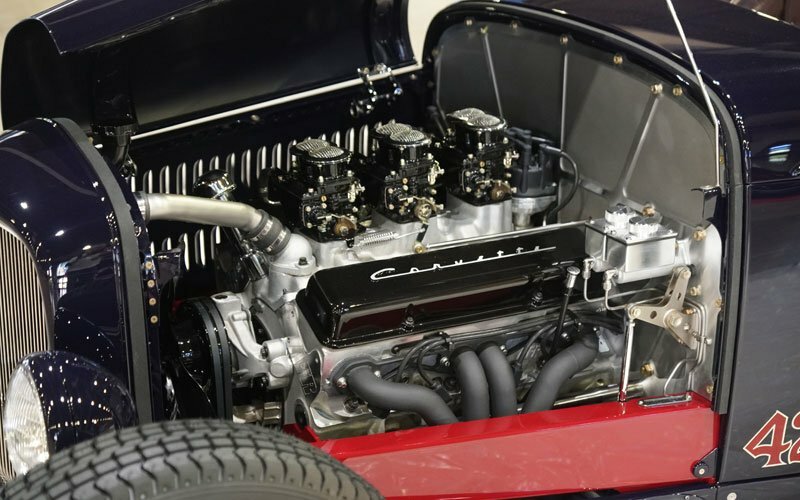 The engine is a build Mercury Flathead 276 ci V8. 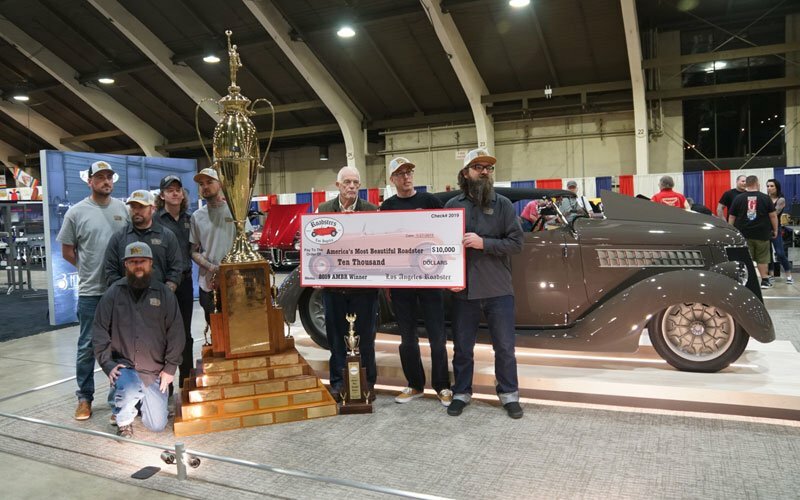 A 1927 Ford Model T Touring car owned by Tina and John Evans of Camino, California is in contention for the top award. 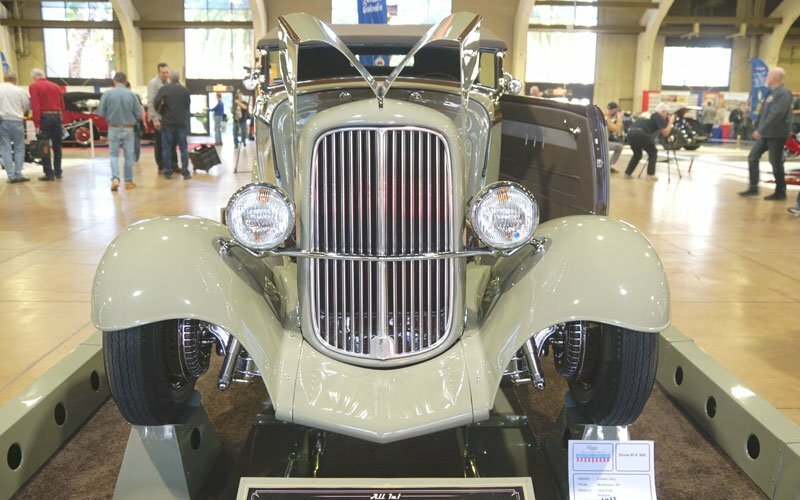 They call it the ” ’27 Teed Up.” It was built by J.B. 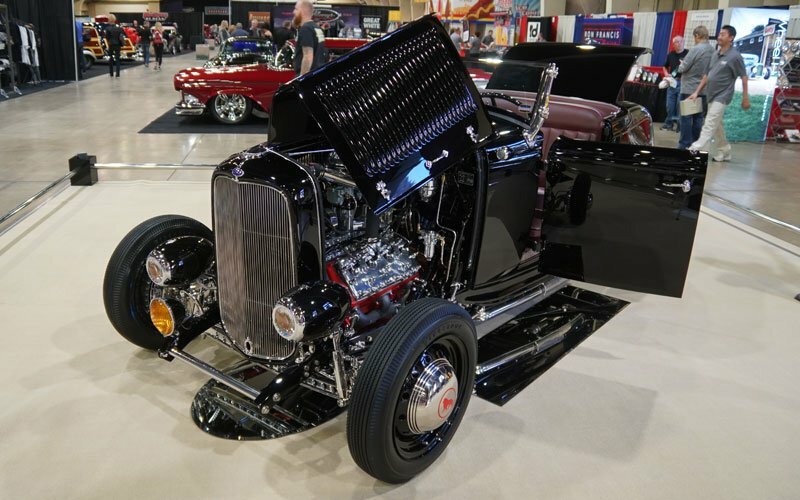 Custom Designs in El Dorado, California and has a small block Chevy engine. 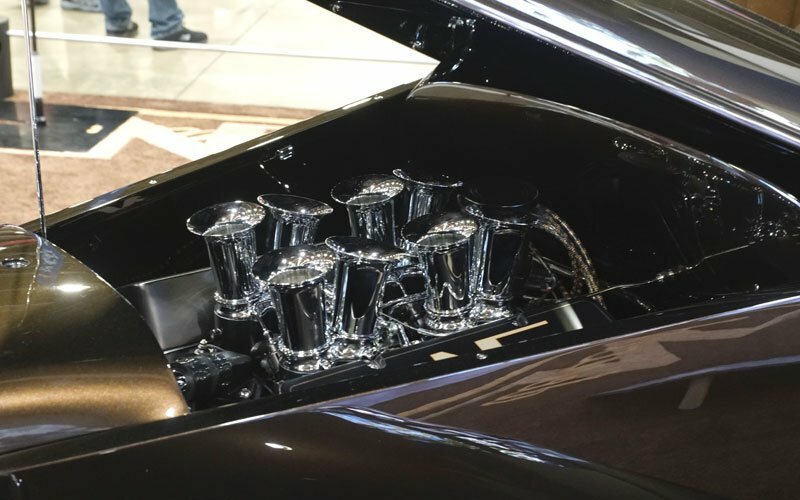 It uses Auto Trend fuel injection. 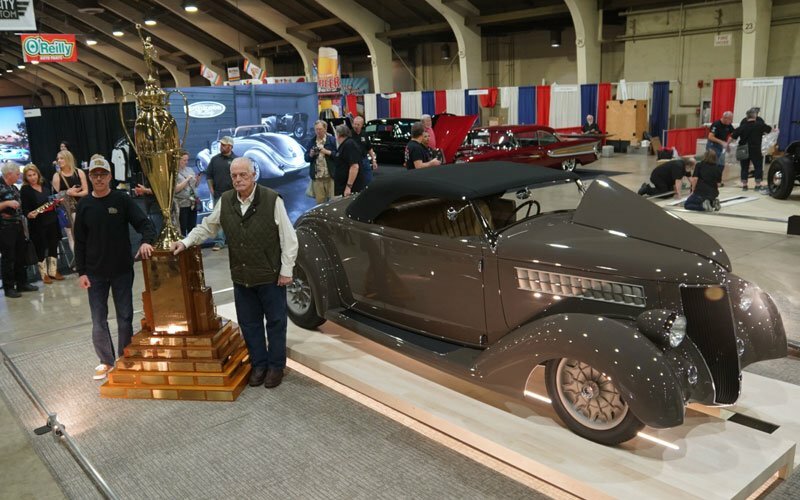 Cliff Mattis of Vacaville, California brought his 1932 Ford Roadster he calls “N Deuced” to Pomona to compete in the America’s Most Beautiful Roadster competition. 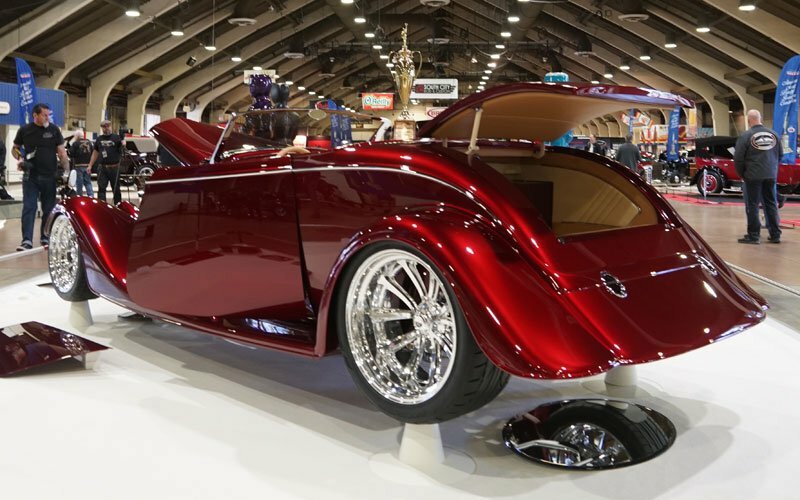 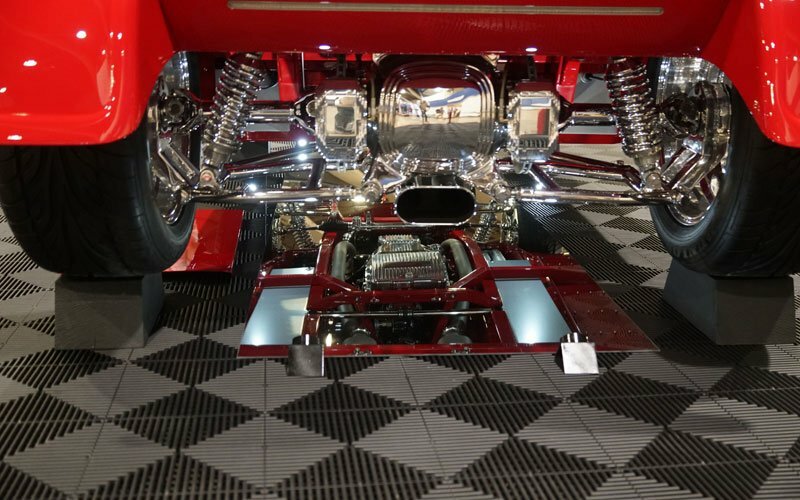 It was built and painted by Lucky 7 Customs, and the Auto Trend EFI stack injection was done by Boyd Coddington. 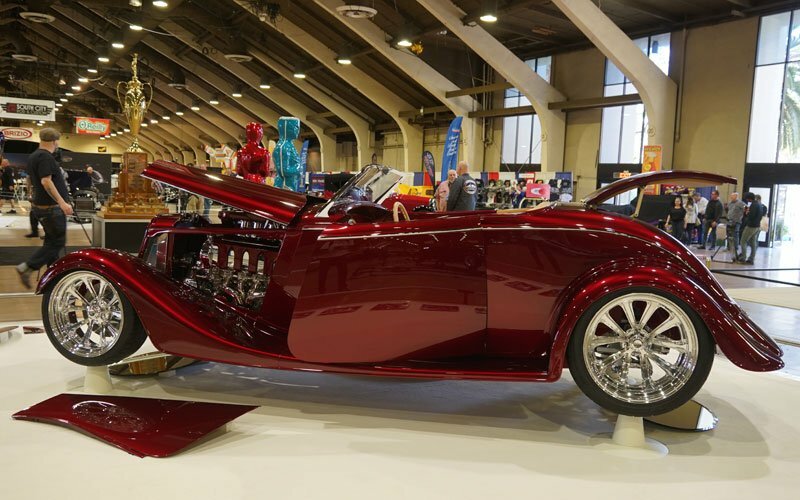 Custom roadster is called "N Deuced"
Joanne and Tom Sargis from Redwood City, California brought their 1933 Ford Phaeton to compete for America’s Most Beautiful Roadster. 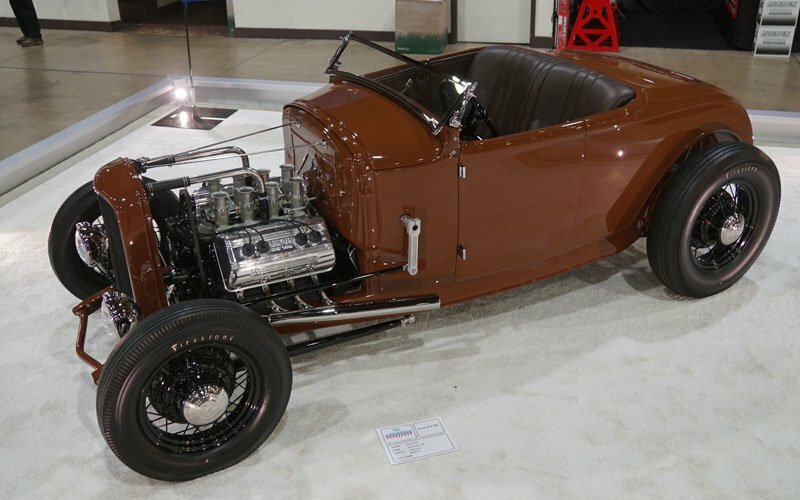 The sweet PPG paint by Compani Color was laid down by Jim Hayworth. 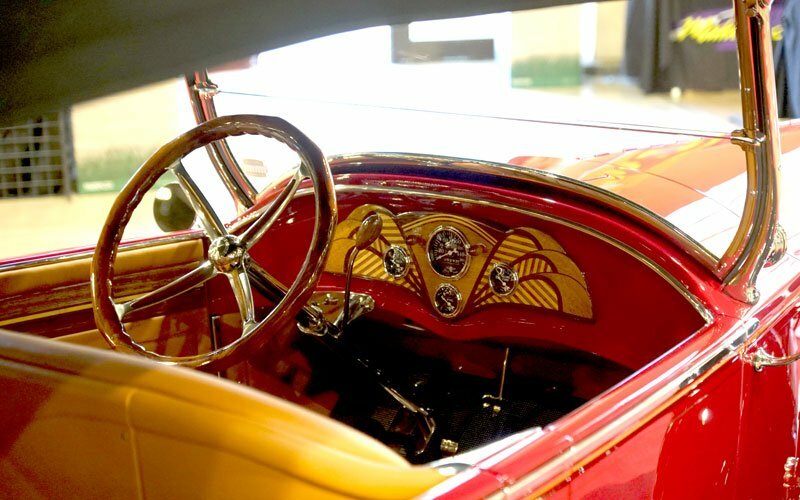 Beautiful detailing by Stephan Lungstrum. 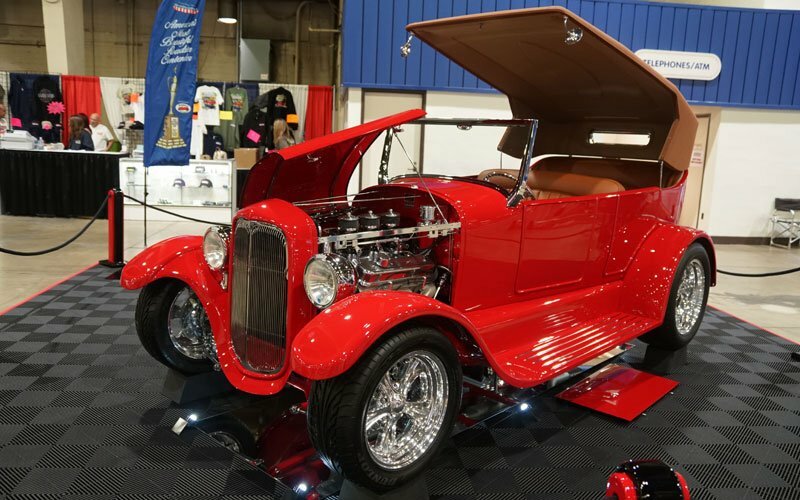 Ray Enos of Plains, Virginia brought an old school classic hot rod to compete for the America’s Most Beautiful Roadster Trophy this weekend. 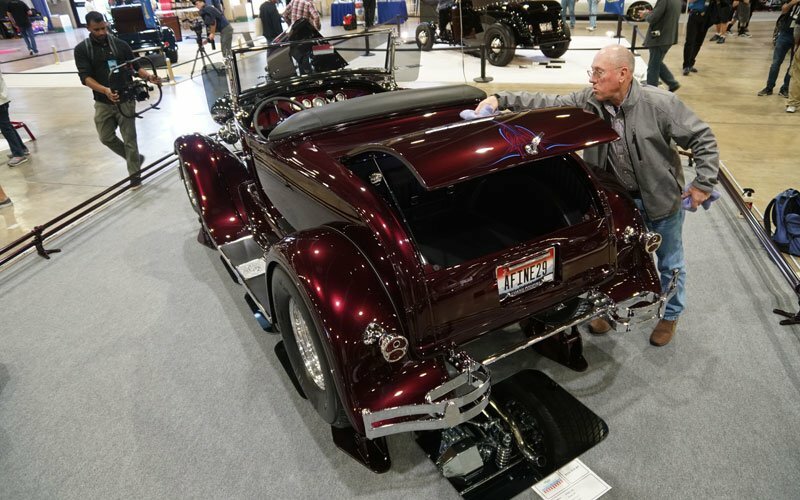 His 1930 Ford Roadster will be on display this afternoon. 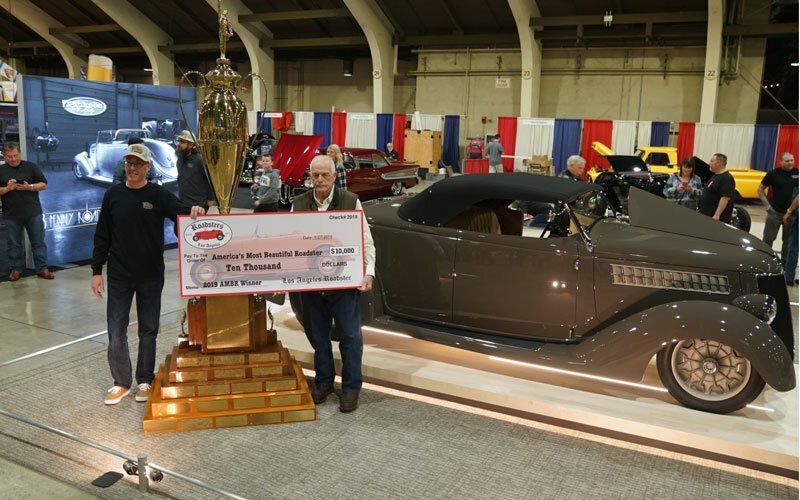 We are waiting for the announcement on the winner here at the Pomona Fairplex. 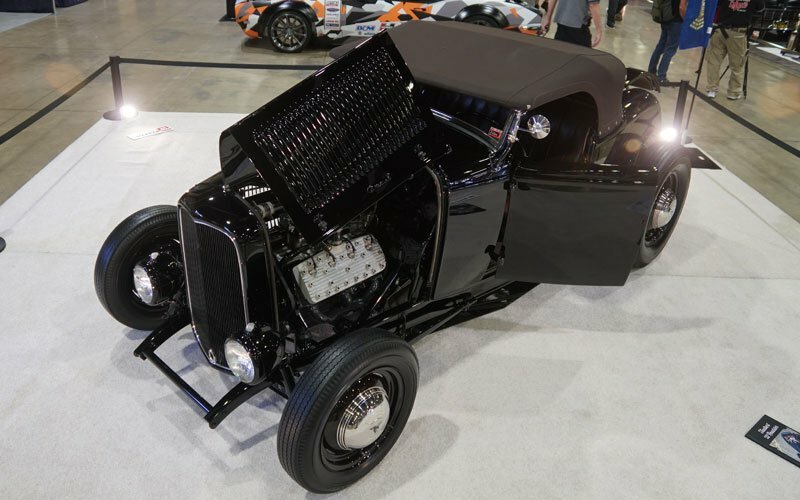 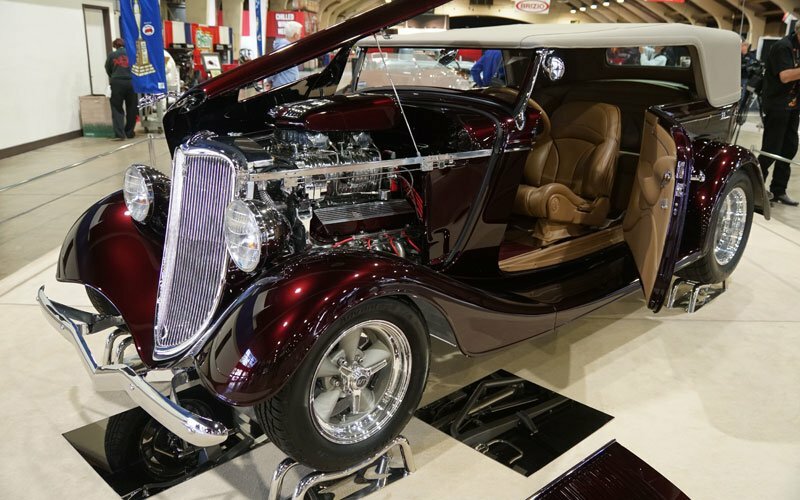 Bill Grimsley’s 1932 Ford Roadster was built by a team from car guys. 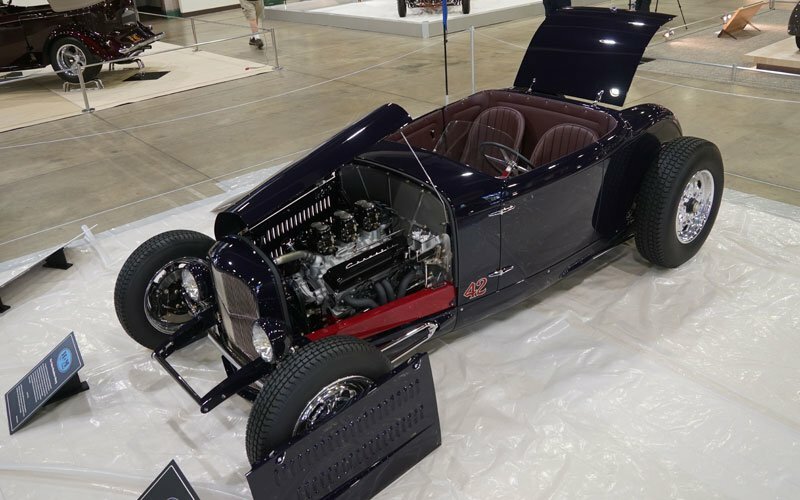 Jackie Howerton and Bill Moal did most of the engineering and assembly so they call it the Howerton & Moal Tulsa Roadster. 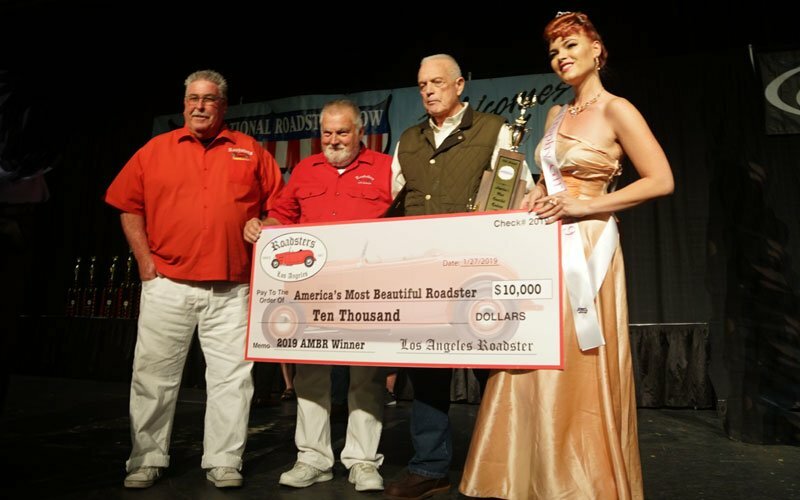 They are anxiously awaiting the announcement for this year’s America’s Most Beautiful Roadster Trophy.